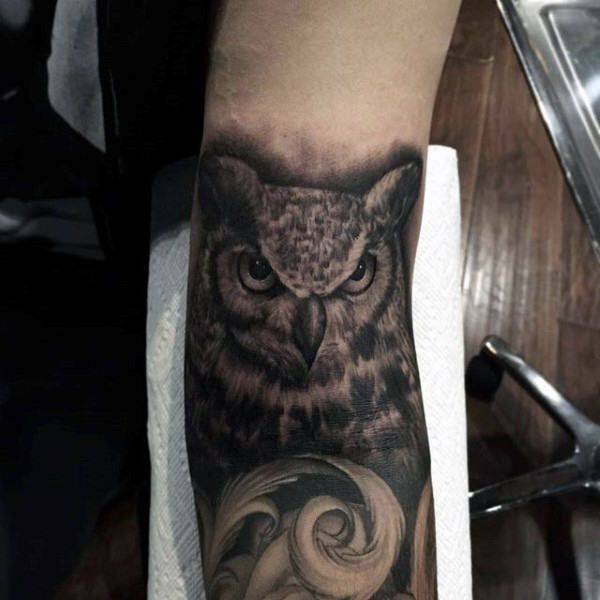 Beyond birds representing the symbolic image of freedom, the owl in particular is a symbol of wisdom and knowledge. 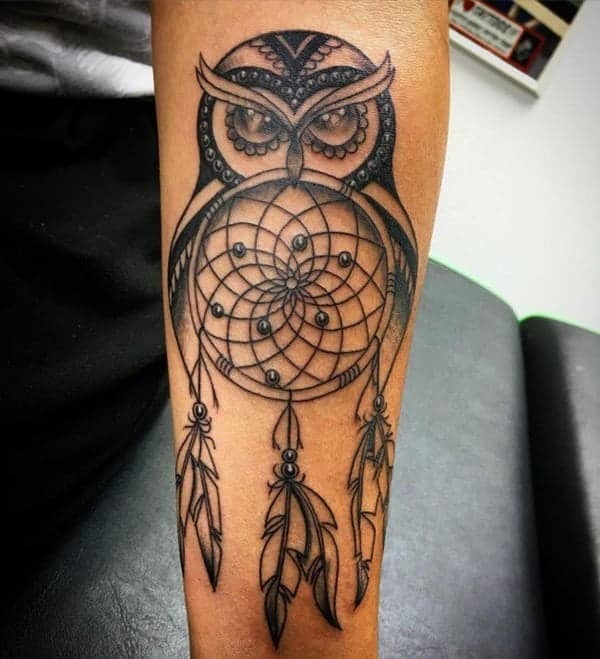 Native Americans worshiped the owl, for he was believed to hold secret, valuable knowledge of the universe. 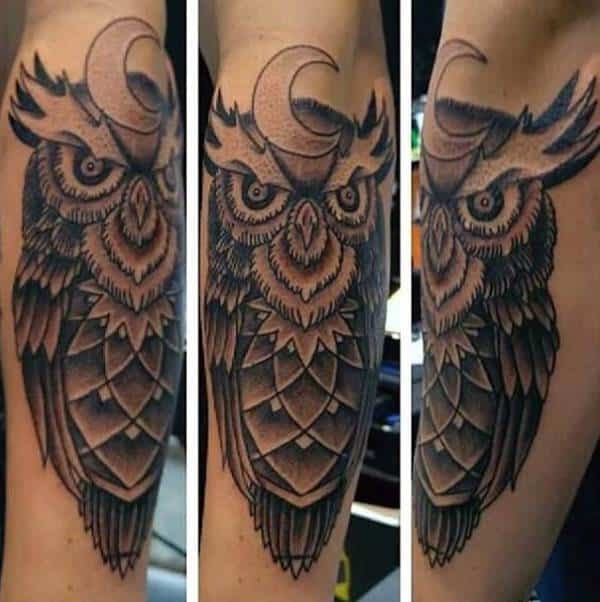 Ancient Egyptians too, worshiped this magnificent creature, and even crafted a hieroglyph of a liking of the owl roughly translating to the consonant sound of the letter ‘M.’ Owls are precise hunters with keen eyes and equally sharp hearing. 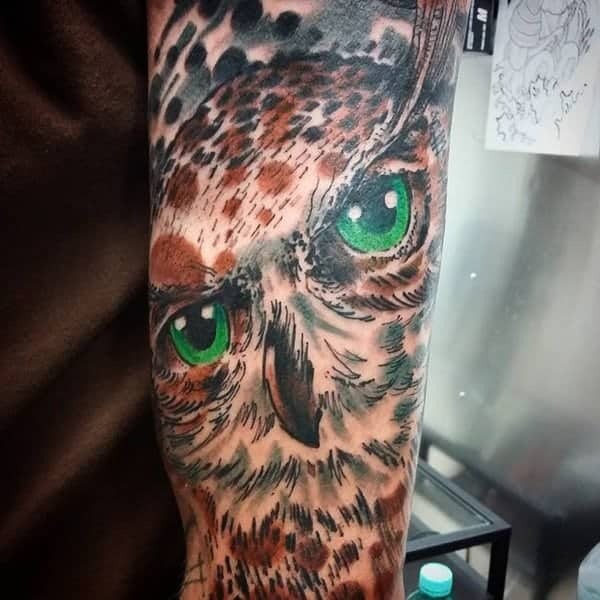 They can be fierce predators, as well as look as innocent with their big eyes and soft fluffy feathers. 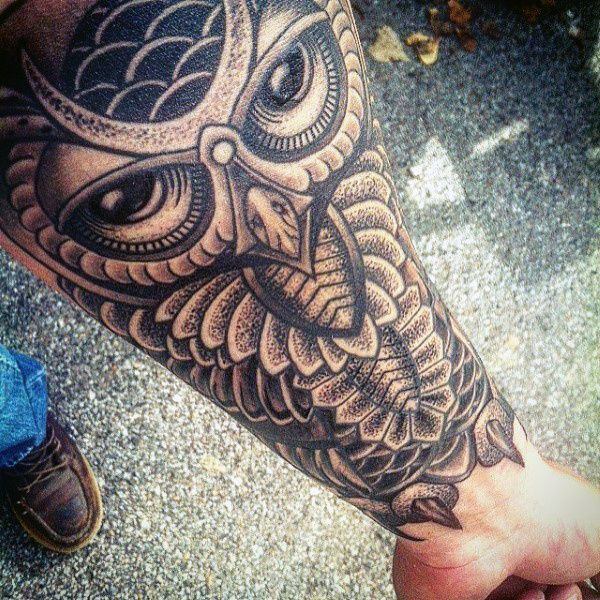 Listed for your viewing pleasure is well over one hundred different stunning images of different owl tattoos. Some look good enough to be a painting, others are indistinguishable from a picture. 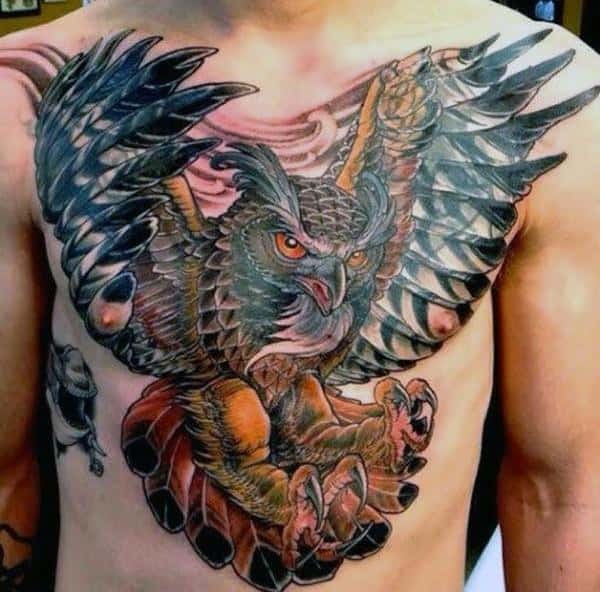 Some capture the more playful and lighthearted essence, others express the predator, the hunter, or the intense version of this magnificent bird. So sit back, scroll on down, and enjoy. 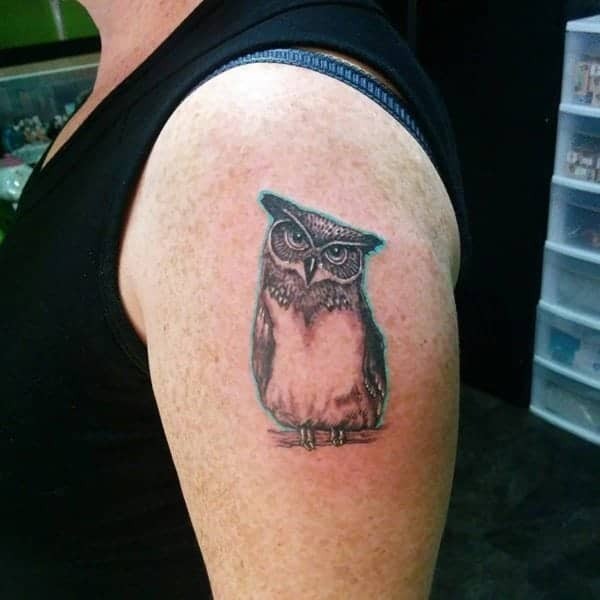 It’ll be a hoot. 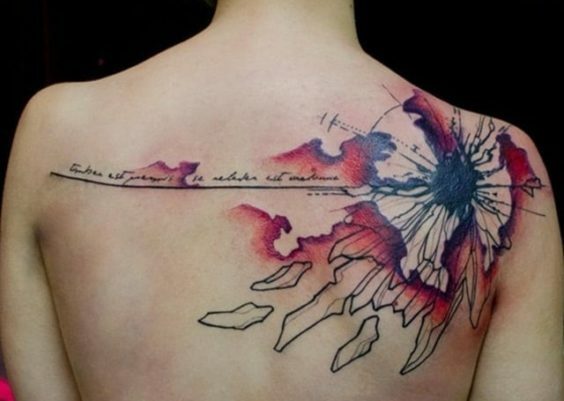 Where does the painting end and the tattoo begin? 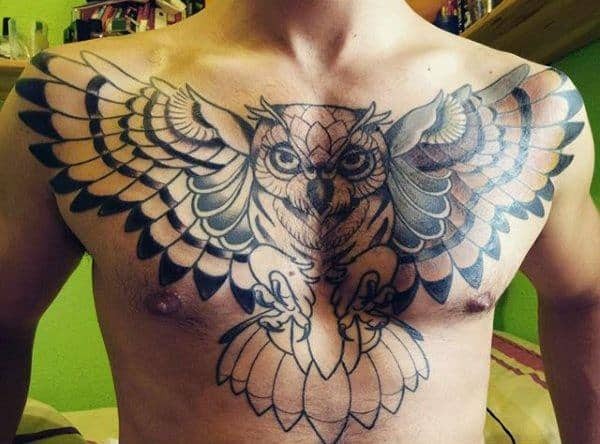 If it weren’t for the geometric tattoo in the background, it might be hard to tell. 2. Here we take a more distinguished look on this dapper fellow. 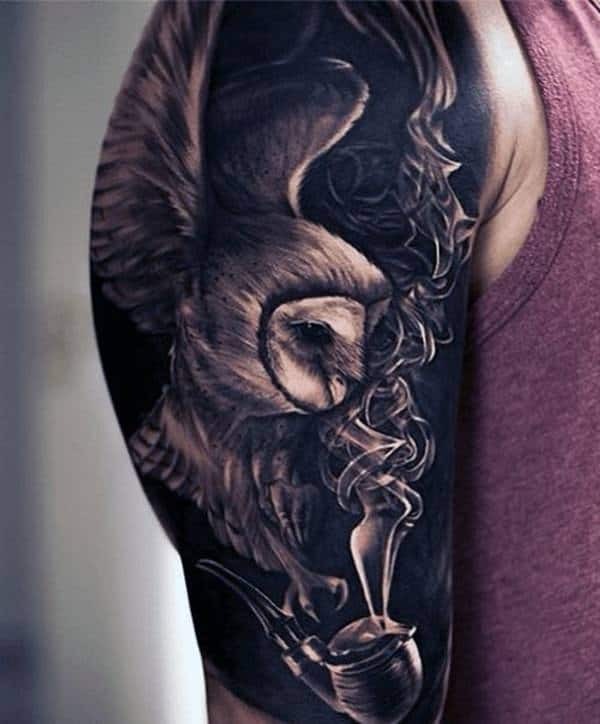 This tattoo emphasizes his mighty claws holding what appears to be a cane topped with another bird species’ skull. The predator and his prey. 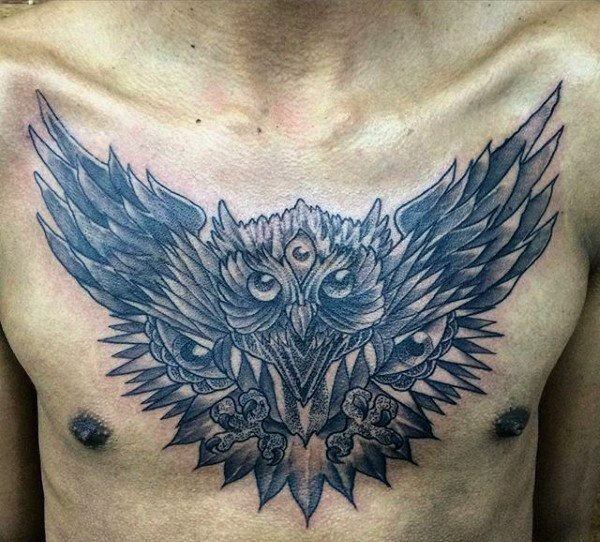 Here we have a detailed yet simplistic owl with prominent geometric features. Something appears to have caught his attention overhead. 4. 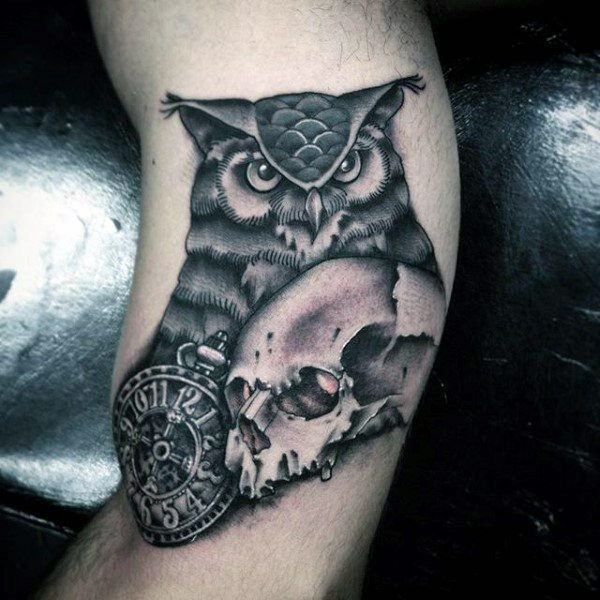 This owl can be faintly spotted peeking out from the shadows of his daunting skull which he appears to be sitting atop. One of his prized possessions. 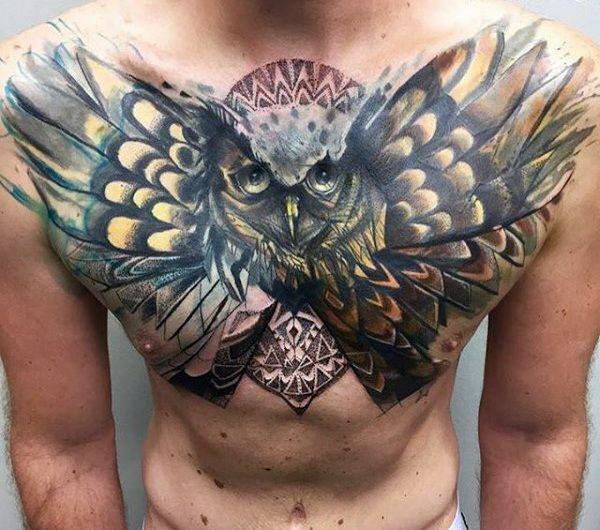 While this impressive chest piece may only be half finished, the owl looks ready to pounce! Living up to his hunter’s reputation. 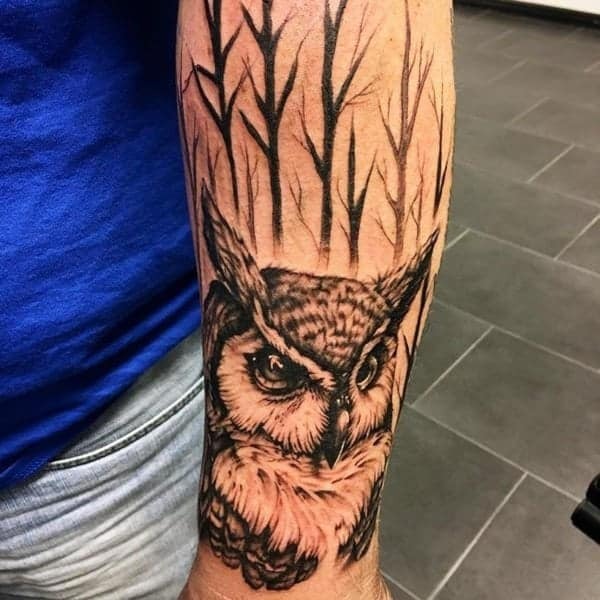 This sage looking creature appears to be perched above a quill, ready to share some of the secrets of the universe with whoever dares to approach. This colorful piece looks like an alternate version of the Mexican flag. 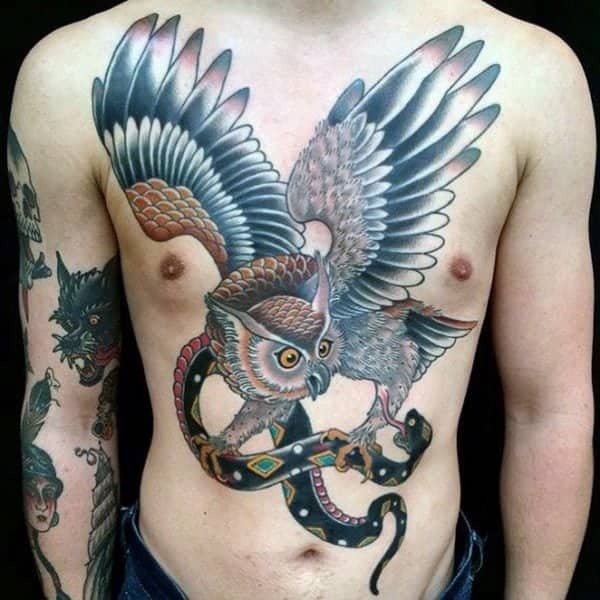 Instead of the Eagle, the owl holds the snake in his clutches. 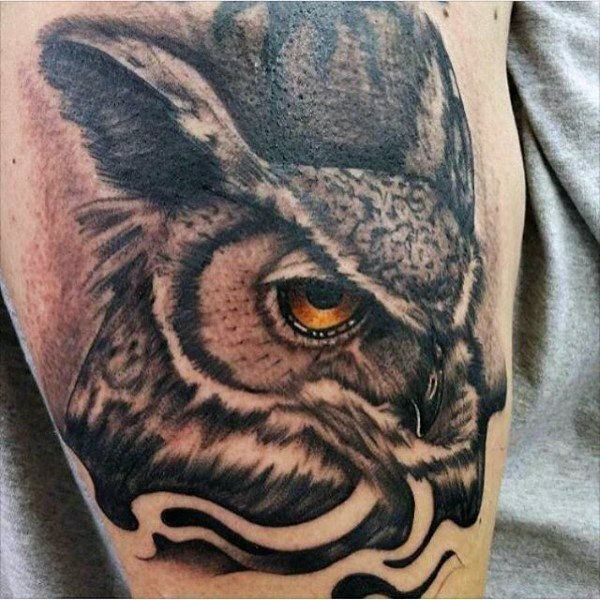 The all knowing eye is a dominant feature of this owl tattoo. 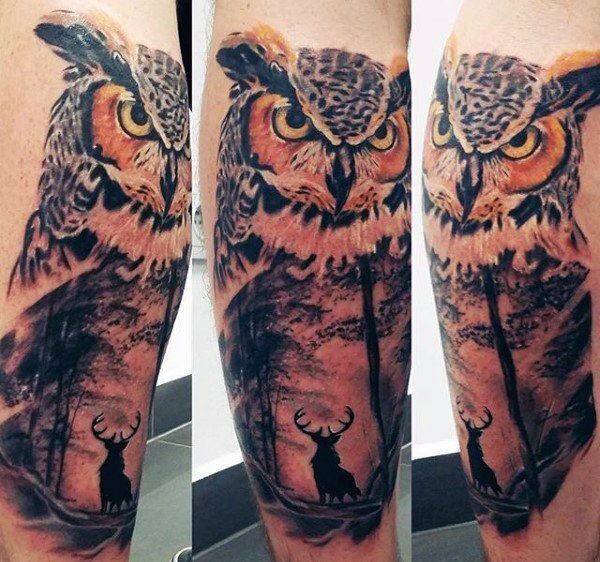 Here is the watchful eye of the forest, the owl, holding a daunting keep over the forest below. 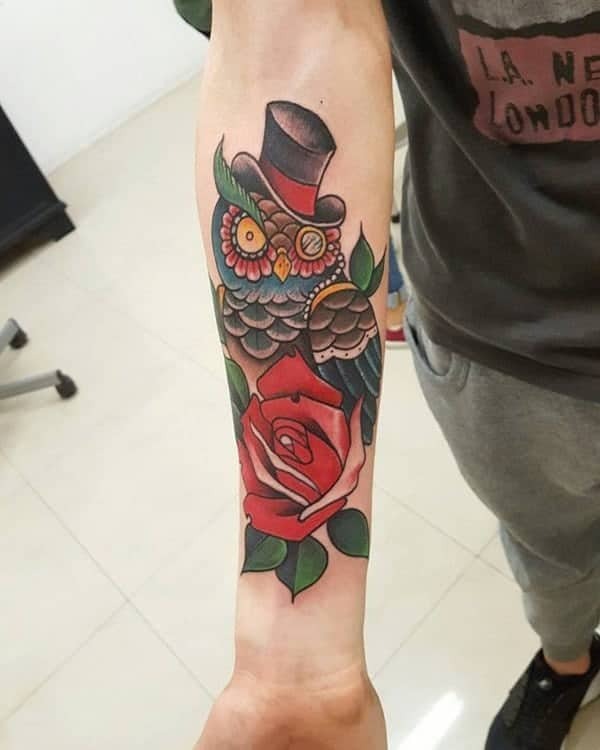 An owl tattoo with a splash of color! 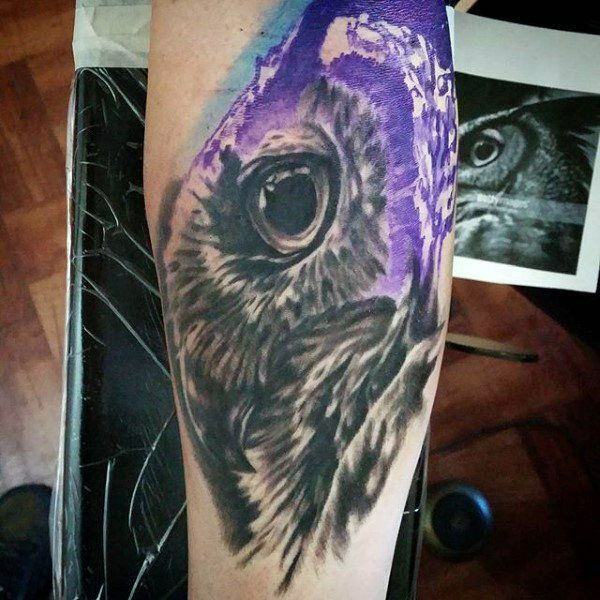 The owl, symbolizing wisdom, with purple, often symbolic of royalty as well as wisdom. These sharp eyes don’t miss a thing! He’s always on the lookout. This colorful yet fierce creature is holding something which looks an awful lot like an organ of some kind, perhaps a heart. 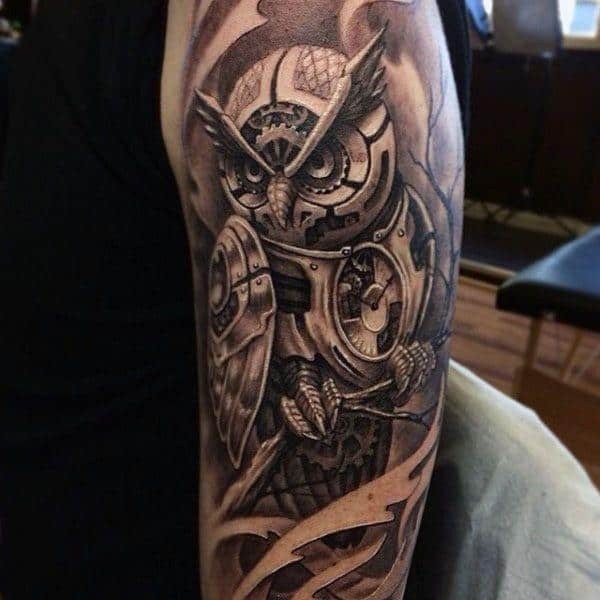 The wise owl, perhaps the keeper of time? And as we all know, you cannot escape time, death always awaits. Or perhaps you can? 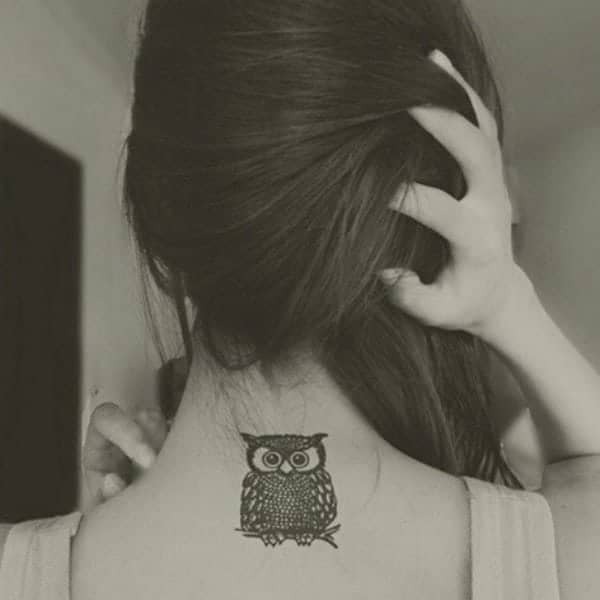 And only the owl knows how. Double the vision, double the intensity. 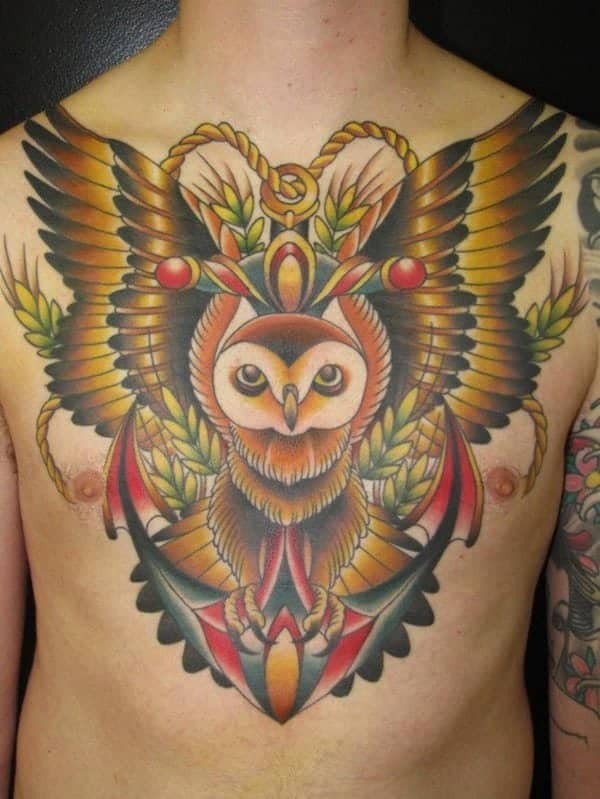 This snappy owl has got himself a bowl o’ gold! And diamonds and pearls as well. He looks crafty, like he devised a genius plan against the mobsters of 1920’s Las Vegas… and made it out alive. 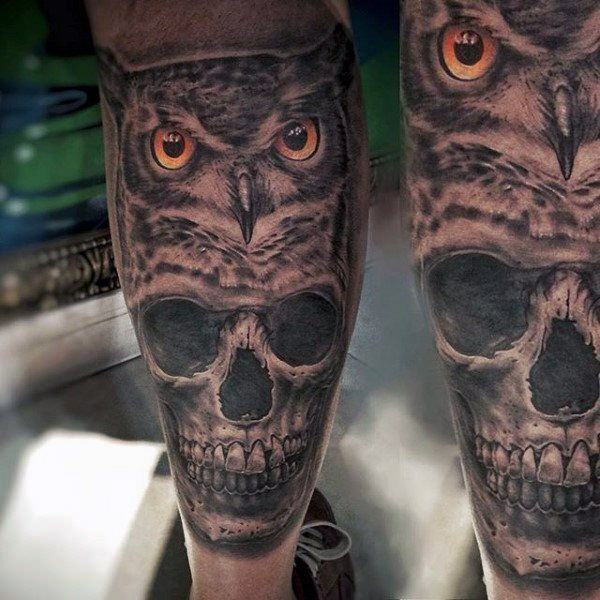 Here we have another owl tattoo holding guard over a skull. 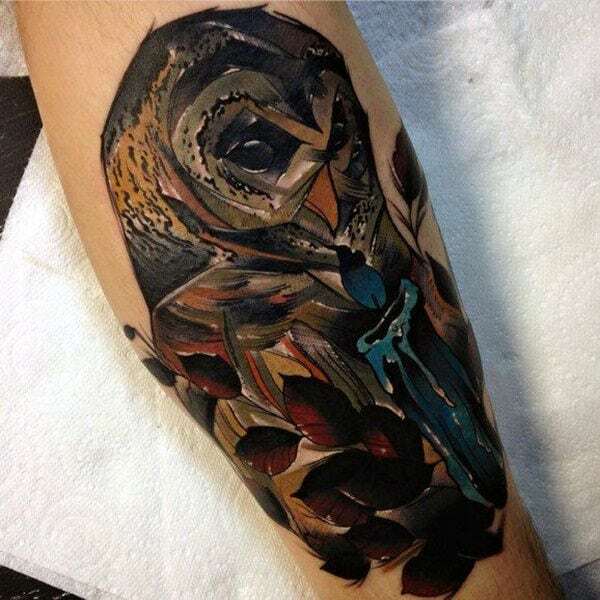 Maybe the owl really is the guardian to the universe’s knowledge. 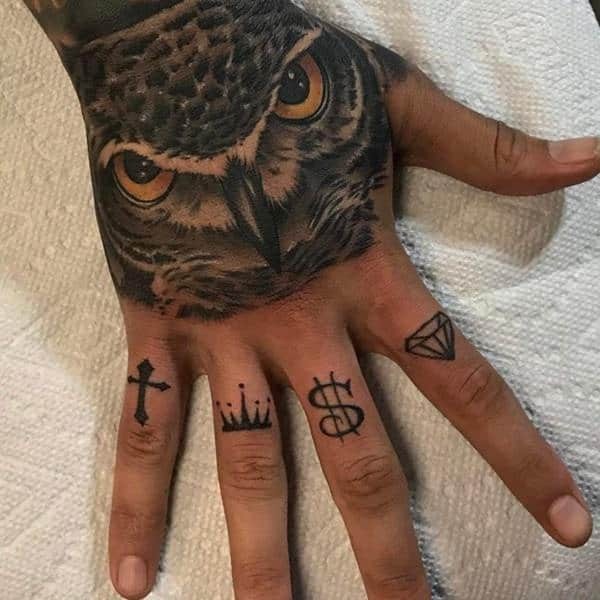 I gotta hand it to you, I would definitely be intimidated by anyone with this fierce creature on tattooed on their hand. 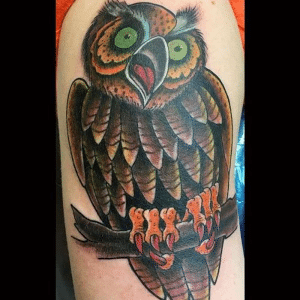 The bold print owl, hued in natural colors yet boldly artistic and beautiful, sits by his ever burning candle, his never extinguishing flame. Too bad not all candles burned the same color flame as the wax, that would be awesome. 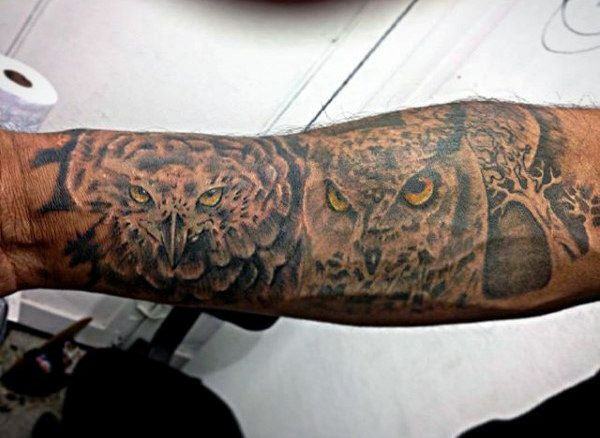 Here we have an owl tattoo suspended on an arm. Above him is the crescent moon. The crescent moon is symbolic of a number of things, largely the nature of life, the ebb and flow of the ever receding tides, the build up and destruction of energy. 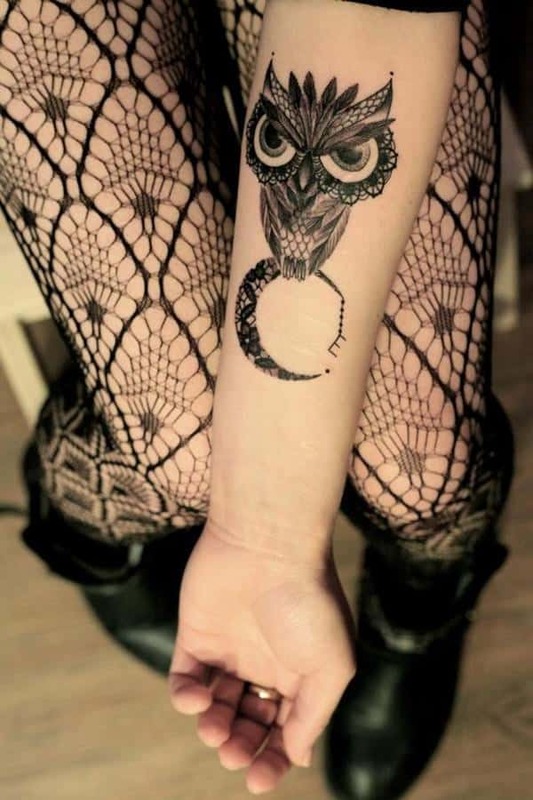 And since the moon is placed at the crown of the owl, are we not to assume it relates to the owl’s all knowing prowess? I think we are right in making such assumptions. This guy’s eyes seem to come right out of that man’s chest! 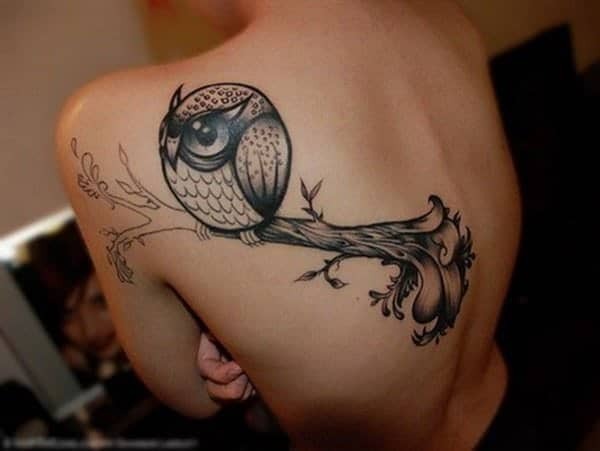 The owl sees something he wants, and he will lead his person in the right direction to find it. 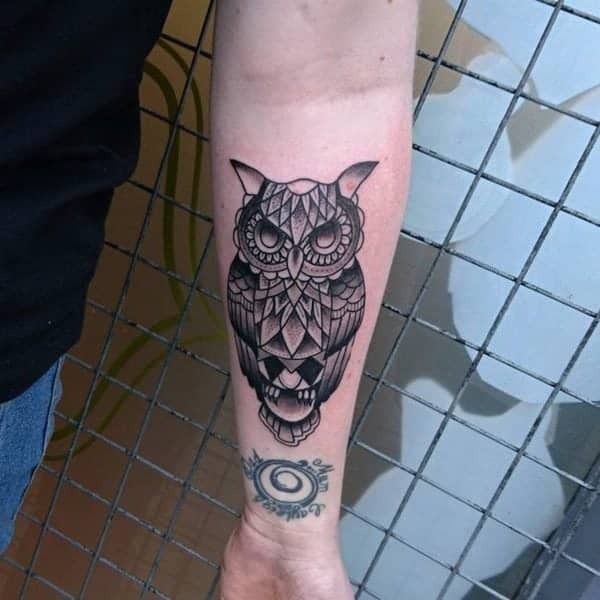 Talons spread, wings outstretched, this highly detailed black and white owl is on the path for something… just what we may never know. The halo of light around his head signifies his righteousness in the animal kingdom. 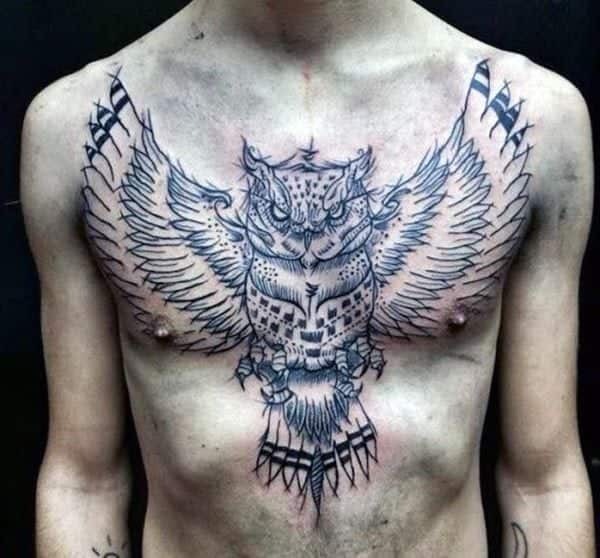 Here we have another owl with a crescent moon adorning his head. This owl looks young, almost cute in the face. And the moon is smaller. 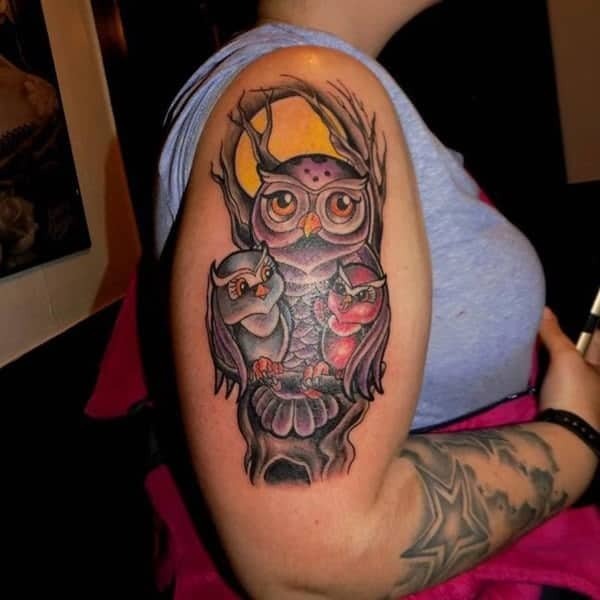 Perhaps that is to mean this owl still has some learning to do before he is as ‘wise’ and ‘knowledgeable’ as his ancestors. 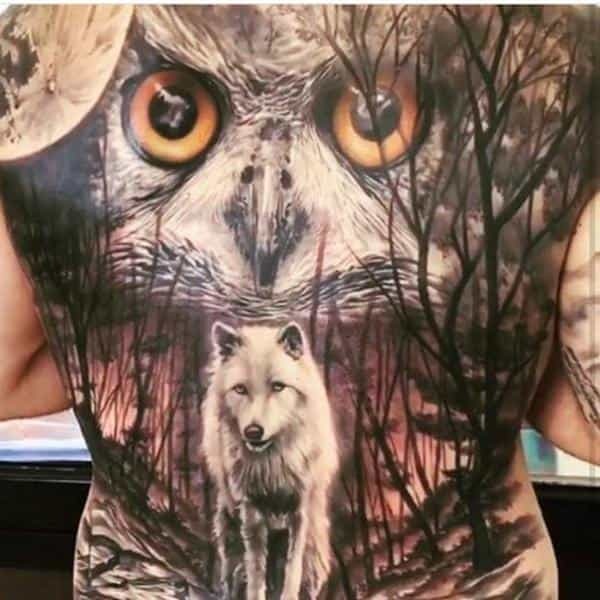 Ah, here we have the owl in his natural habitat, a darkened forest lit by the heavy full moon. 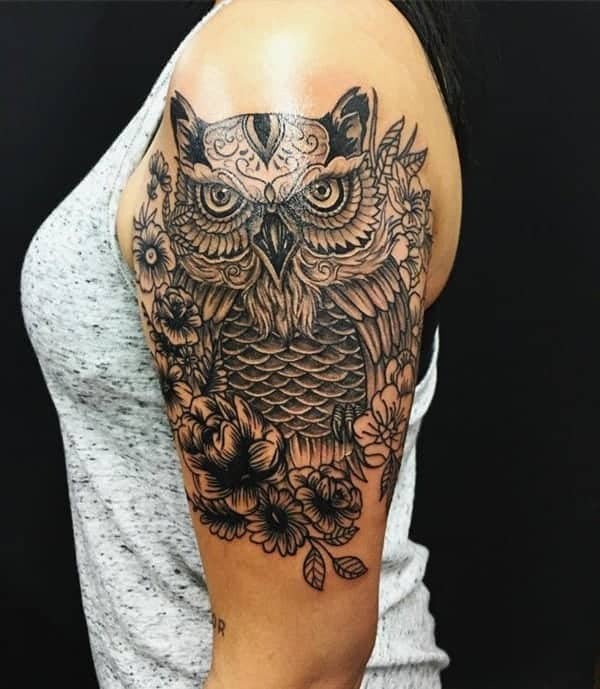 This signifies a new beginning, a new cycle of life, and how there are always opportunities for new beginnings… just as there are always going to be full moons. 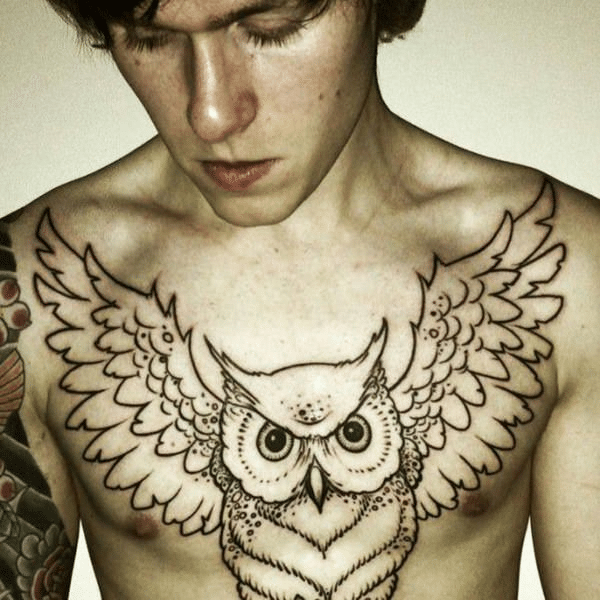 The outlines of what is sure to be a stunning owl tattoo. 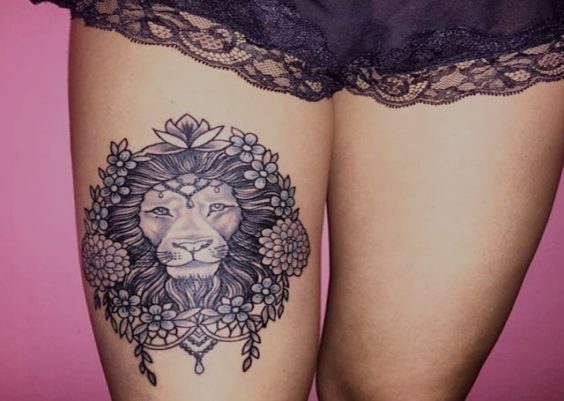 The clear sketch lines give this tattoo a very unique look. Here we have what looks like a snowy owl, a breed that has softer features than some of his more intimidating cousins, swooping down on a smoking pipe. 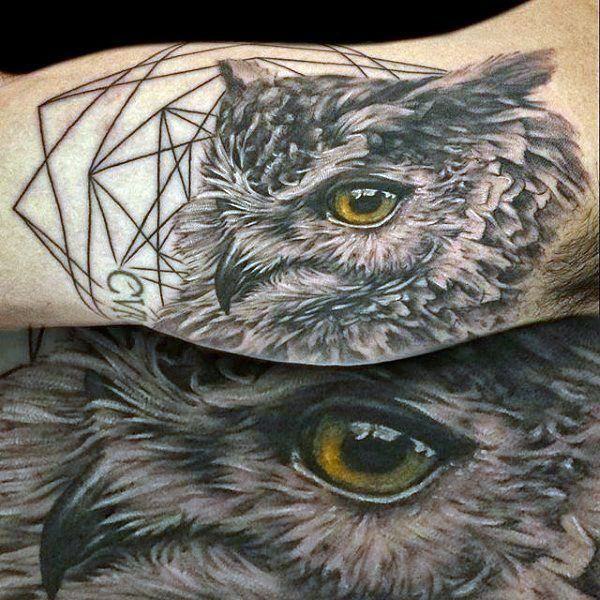 This owl tattoo incorporates sacred geometry at its finest. 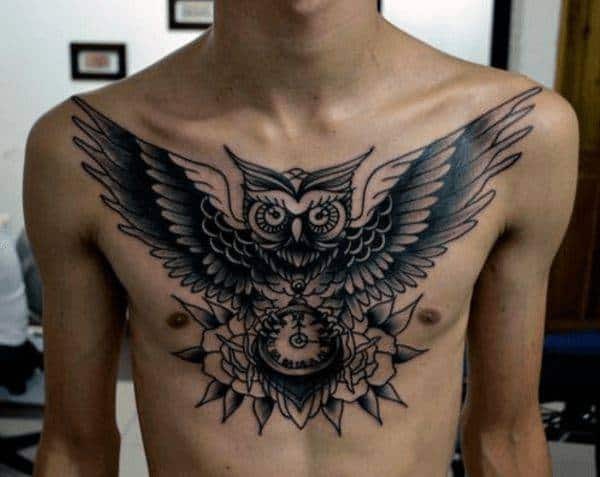 There’s the connecting circles and triangles, with another owl figure overseeing the real owl in flight. Another piece with sacred geometry. 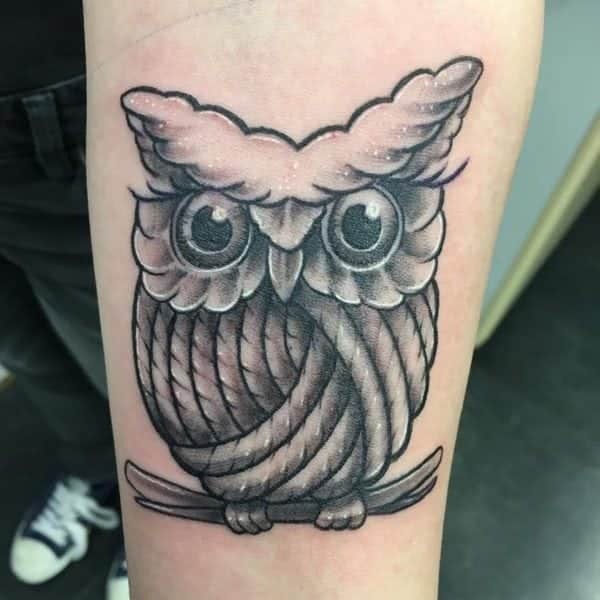 Though this owl’s eyes are shut, deep in thought. 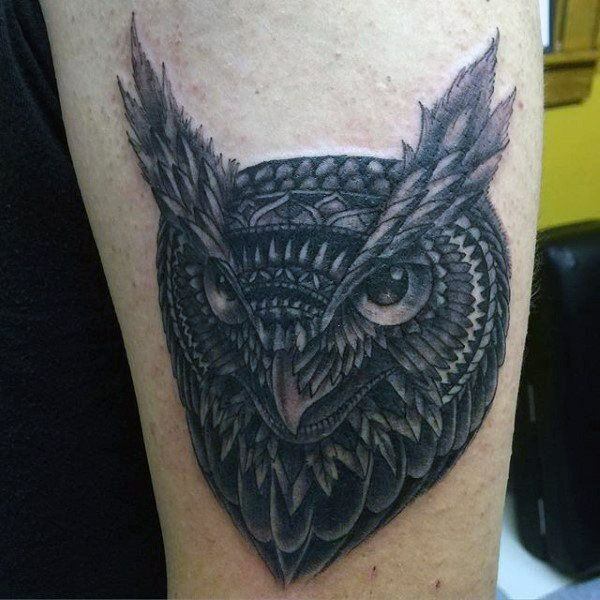 Here we have another black and white owl with a crescent moon adorning his crown. 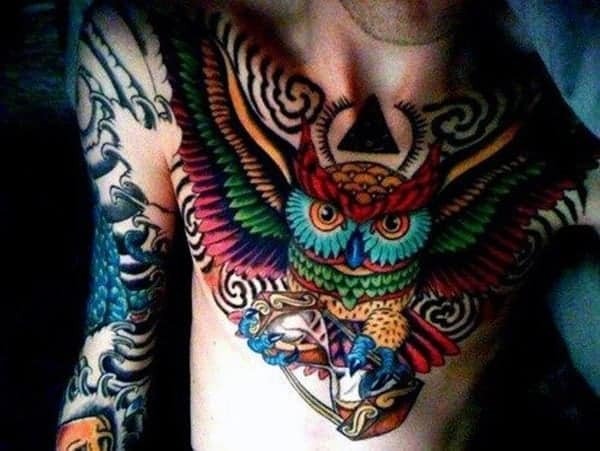 This colorful guy is coming right at ya! 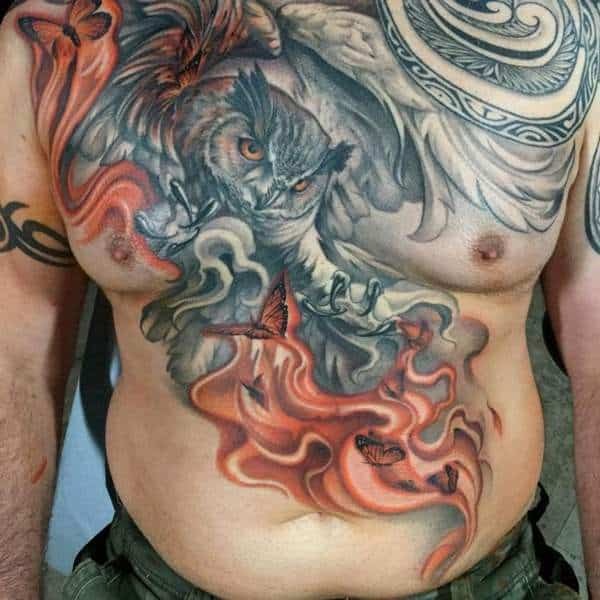 There’s a lot going on in this colorful piece; we have an owl mid flight, looking at something in the distance, all the while maybe running from a flame? This bearded bandit has some muscular talons ready to strike, maybe he grew that extra fourth claw with age? This little messenger is carrying a heart just for you! 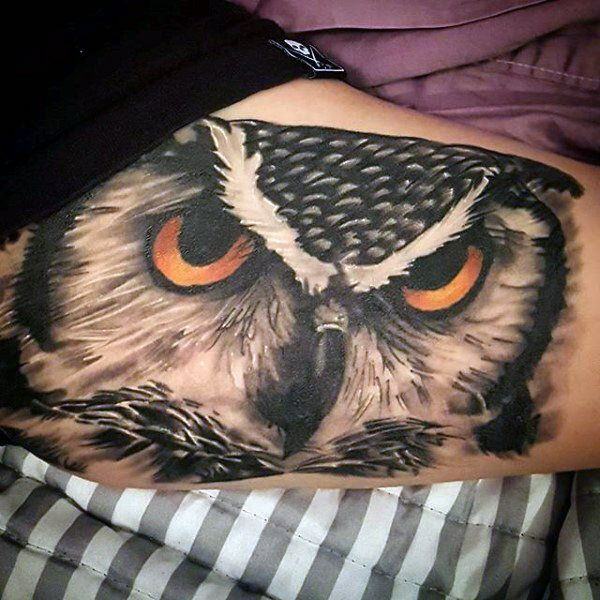 This owl has its bloody prey, ready to devour. 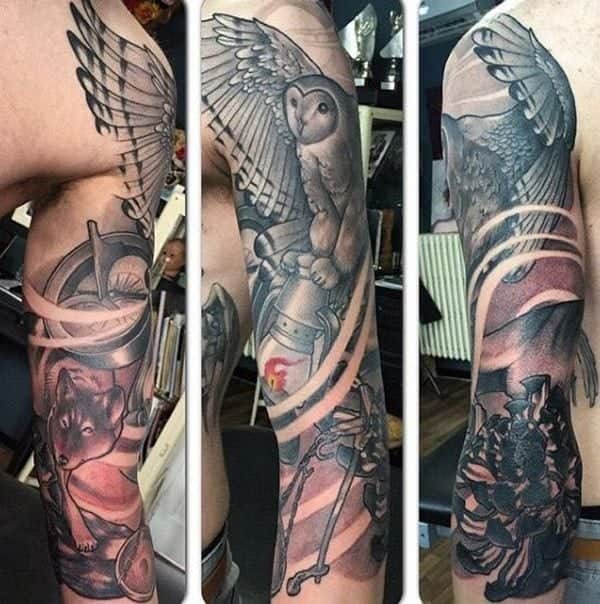 A steam-punk, Metropolis kind of owl. This beautiful horned owl is in mid ‘hoot-hooting’ as he is surrounded by the colorful fall breeze. 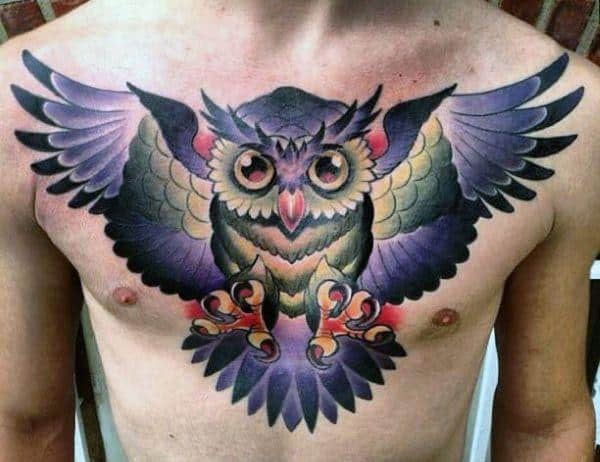 Another bright chest piece, this royal purple owl’s eyes are bright and expressive. 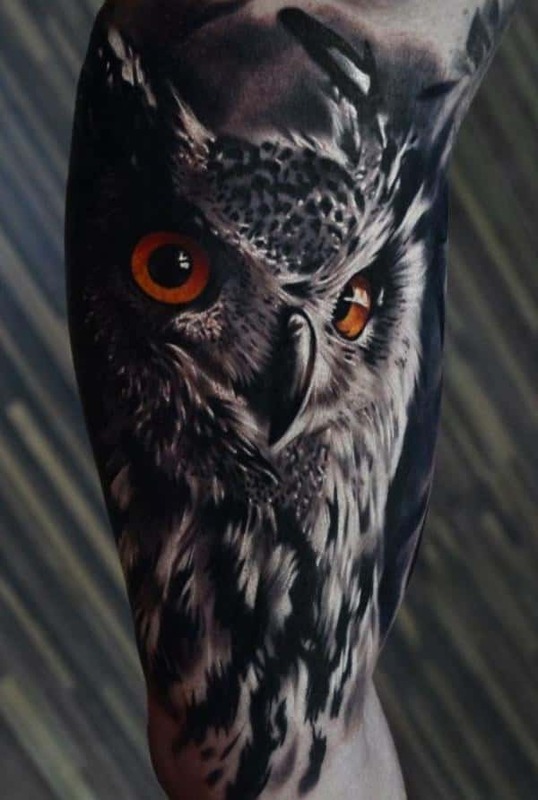 A real snowy owl peeking out from a pec. This mother hen, as it were, is keeping watchful wings around her babies. The full moon in the background really brings the scene to life. 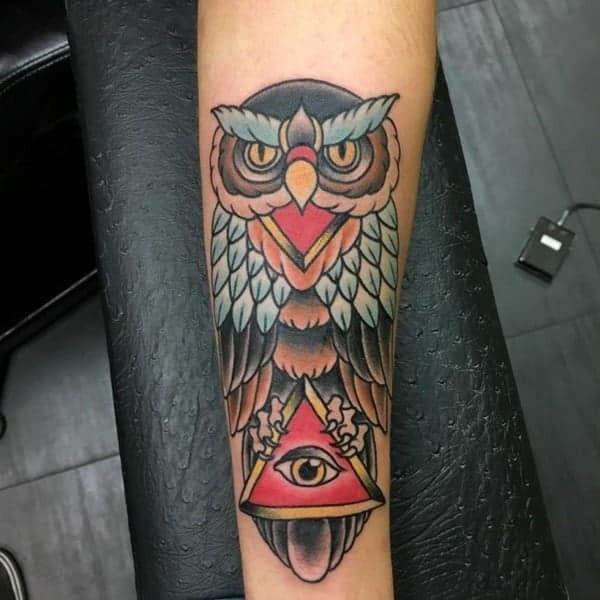 While this owl may be blind and without sight, he has the all seeing eye at his eternal disposal. 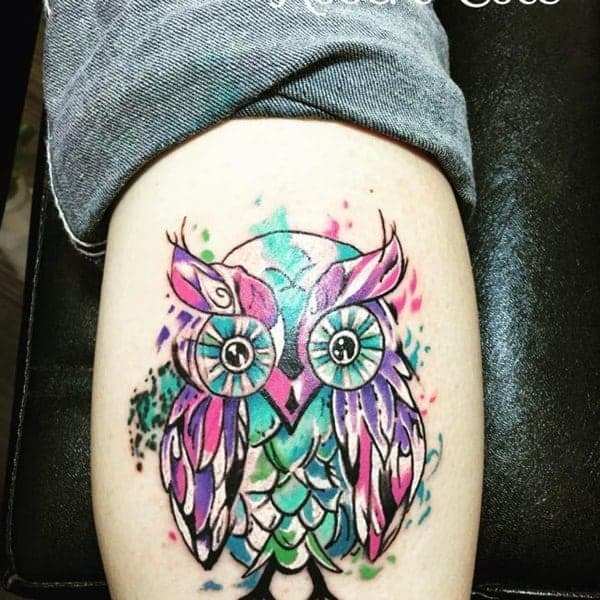 A fun watercolor owl with big beautiful eyes and lashes. 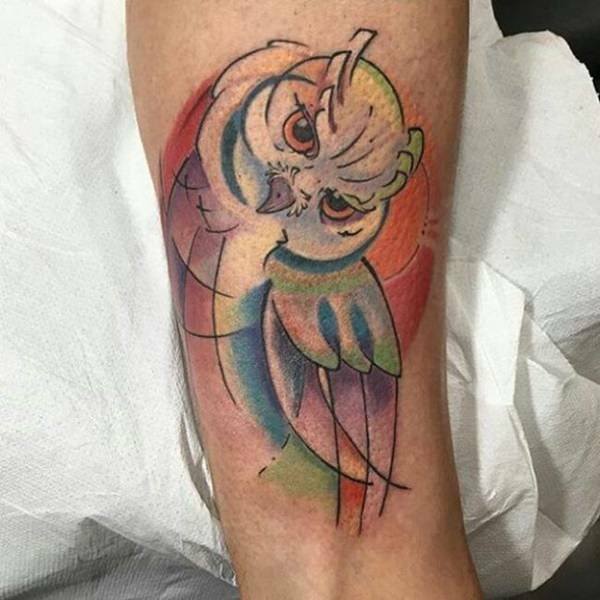 This little guy looks alike a cross between a bright MaCaw Parrot and a grumpy old owl. 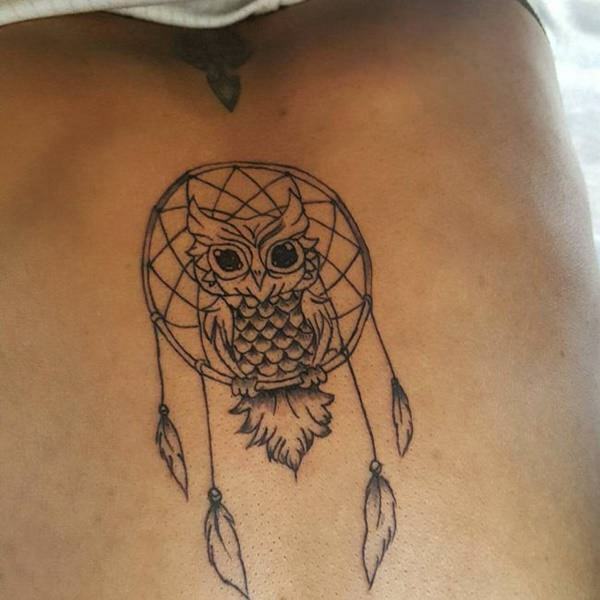 Dreaming of cute little owls? Dreams can come true… if you can catch them. 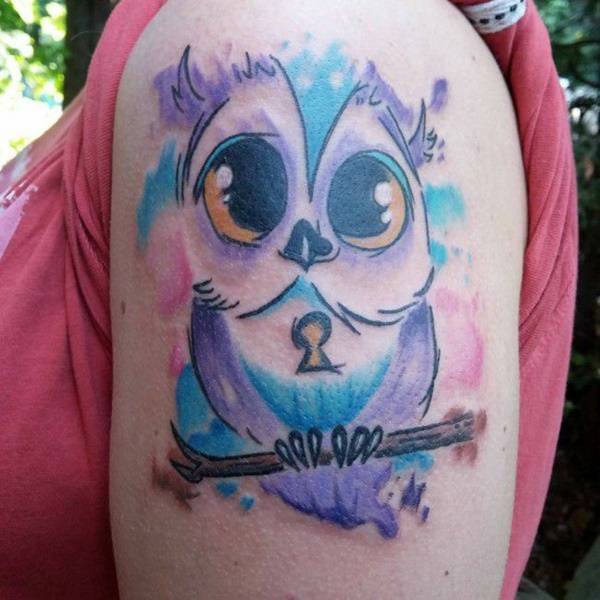 A disney inspired watercolor owl… with a keyhole in her heart. 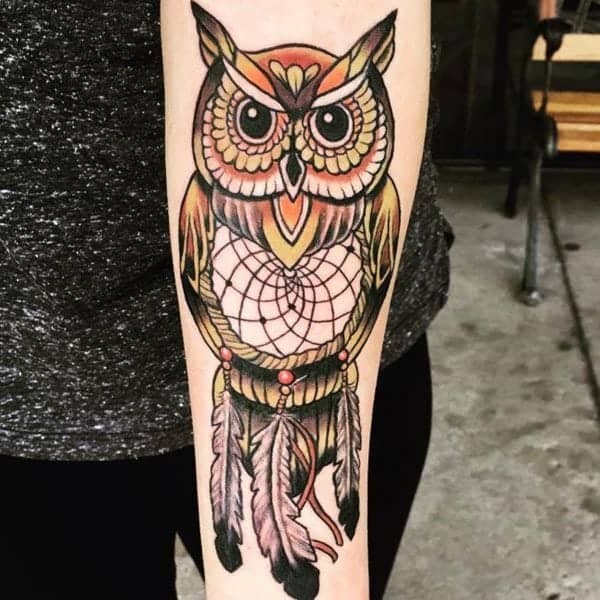 This Russian doll inspired owl keeps watch over her intricate dream catcher. You’ve got eyes on the back of your neck. 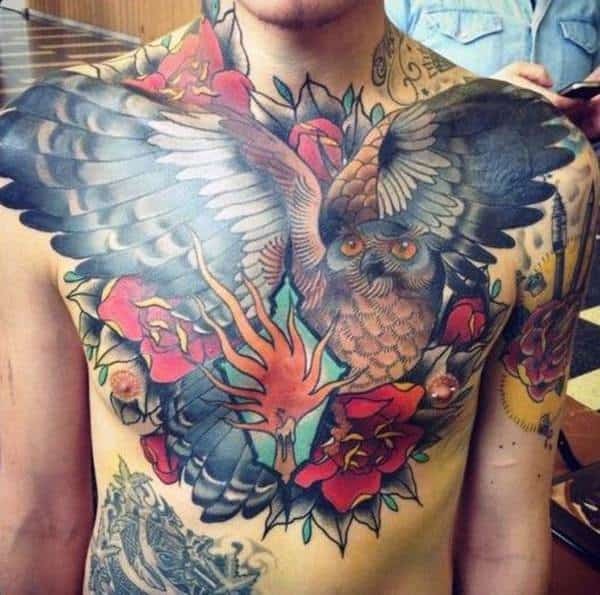 This owl seems to be flying with the butterflies.. he also looks like he wants to eat one of them. 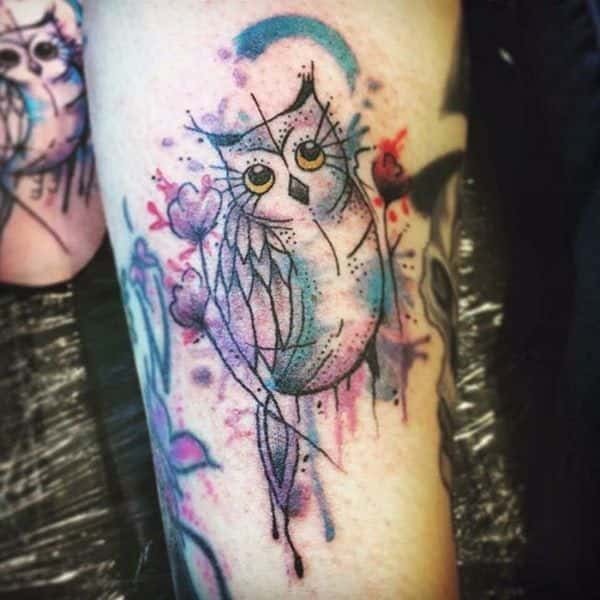 This beautiful owl sits among her pretty purple flowers, looking at the wonder in the world. An owl that loves to read! Gotta stay knowledgeable. 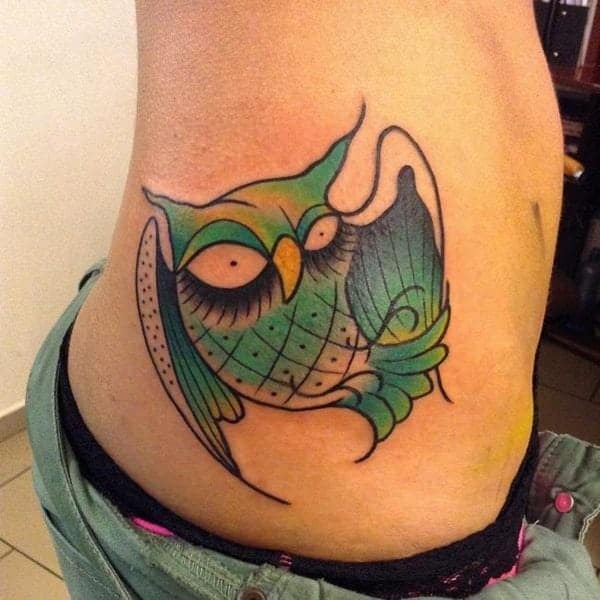 This cute owl’s big eyes and simple body design make for an interesting take and a classic tattoo. 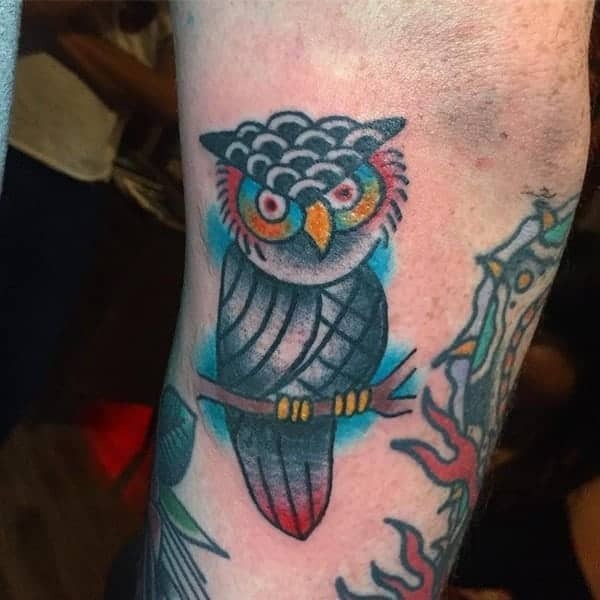 Another super bright, extraordinarily vibrant owl tattoo. This one has beautiful wings, is surrounded by crystals, and looks to be having some fun with those mushrooms growing on his shoulder. 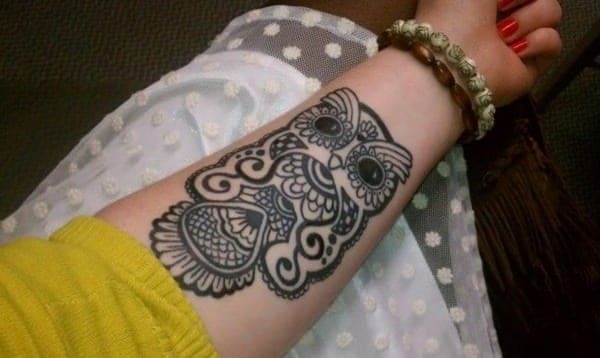 A henna-inspired design owl tattoo. 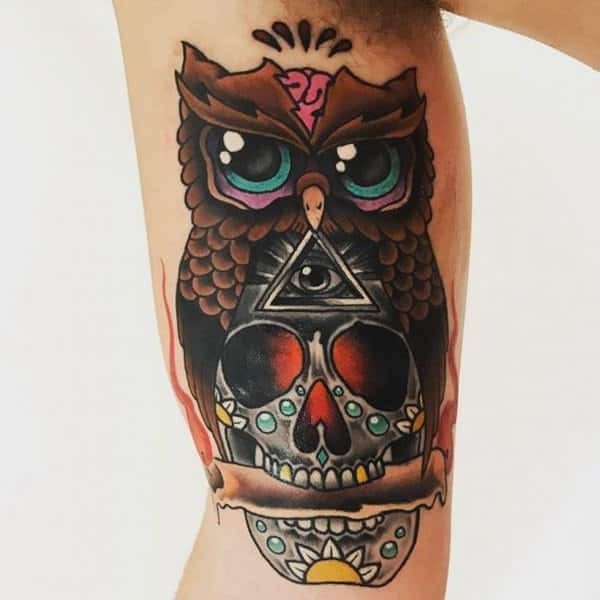 A Dia De Los Muertos inspired owl tattoo. 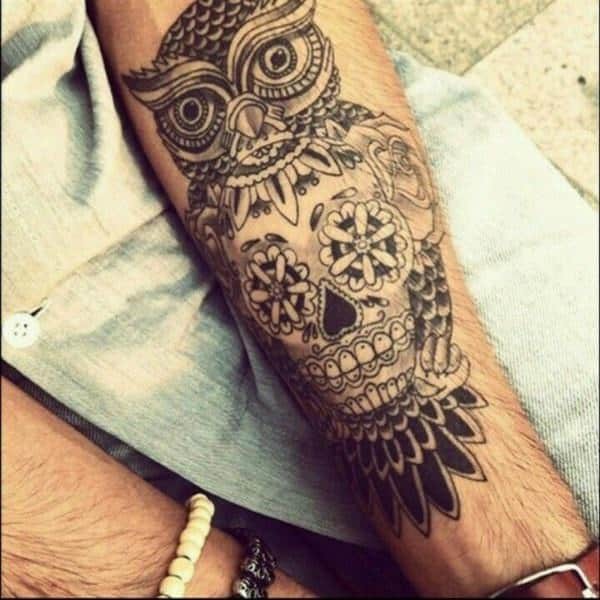 Combinig the creativity in style of the sugar skulls with the owl. 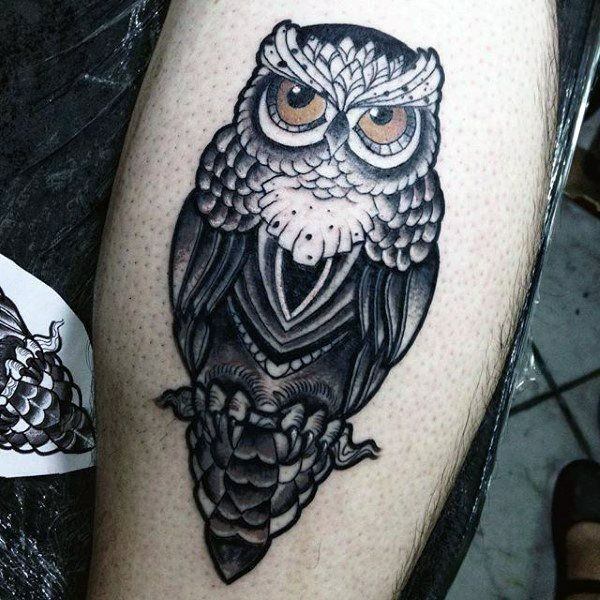 This lacy owl knows something you don’t. 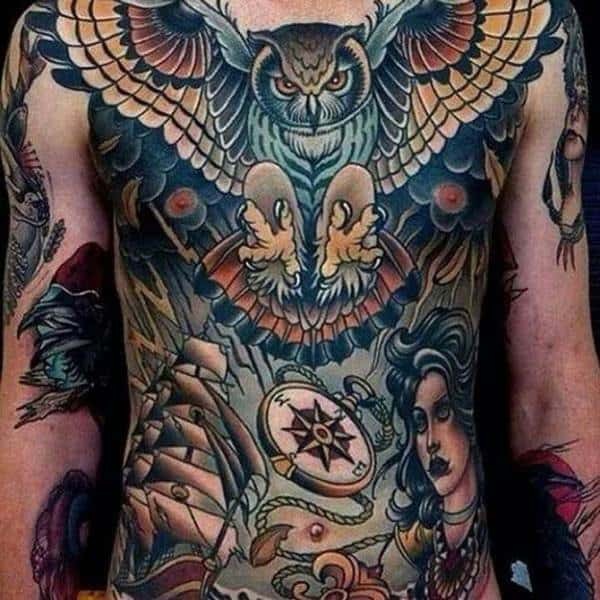 A stunning owl tattoo, looks like a fine painting or photograph! But who would be brave enough to get that close?! 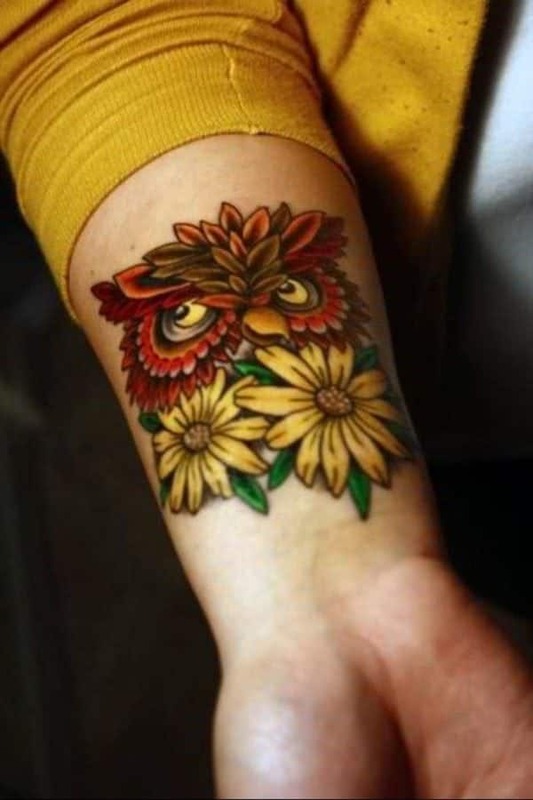 An autumn inspired owl peeking above some fall colored flowers. 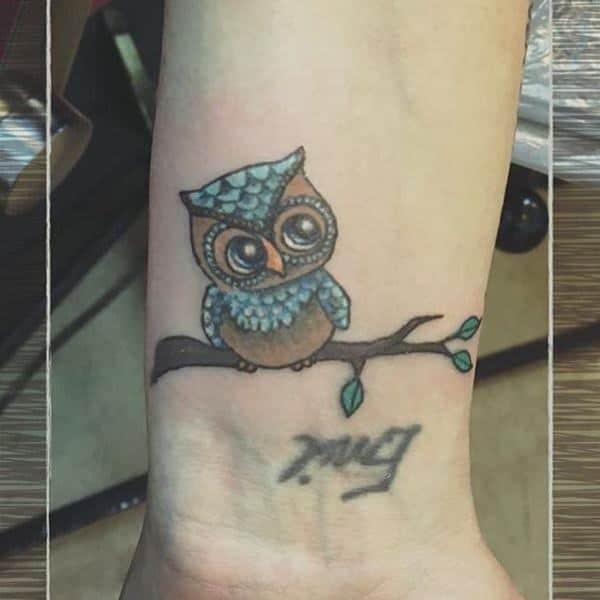 This adorable little owl sits perched atop his forever home- the trusty tree branch. 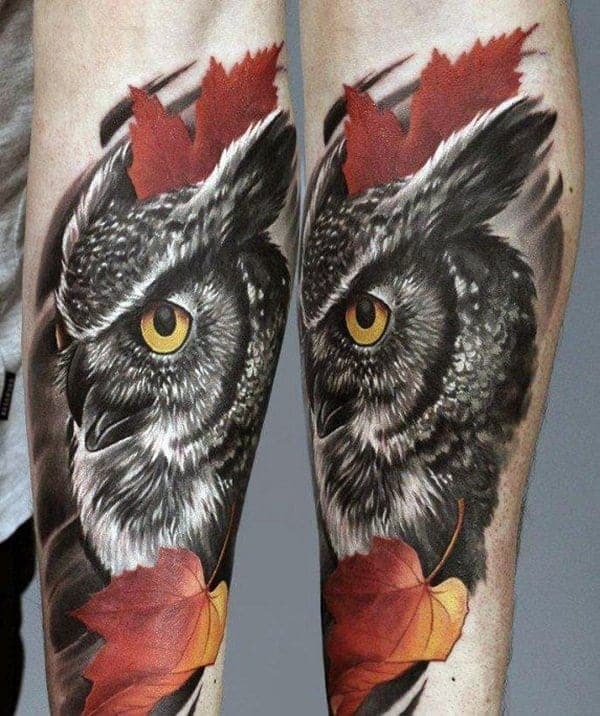 Here’s a beautiful, autum colored owl and dream cather combination. 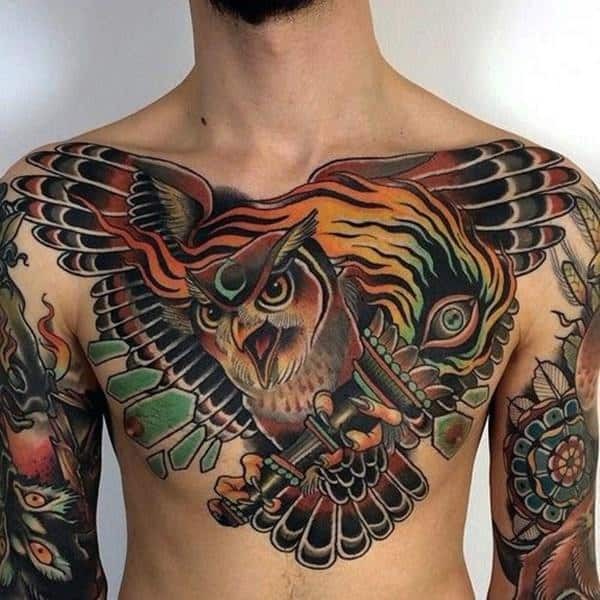 The intensity of this Japanese style owl is unparallelled. 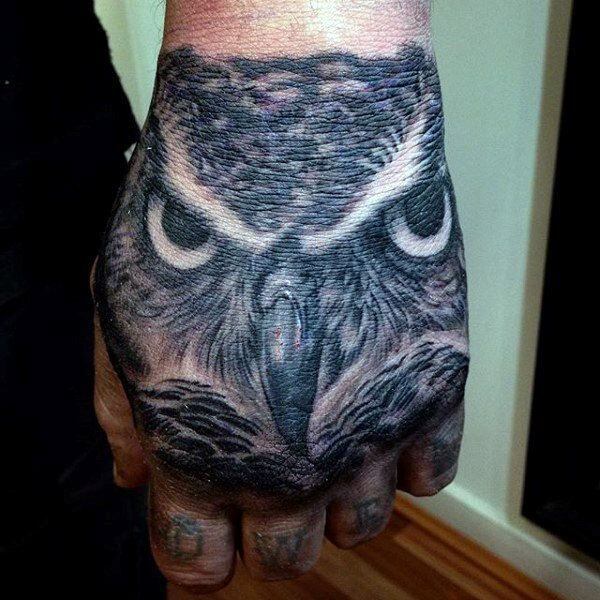 The backs of hands make great placements for owl’s faces. 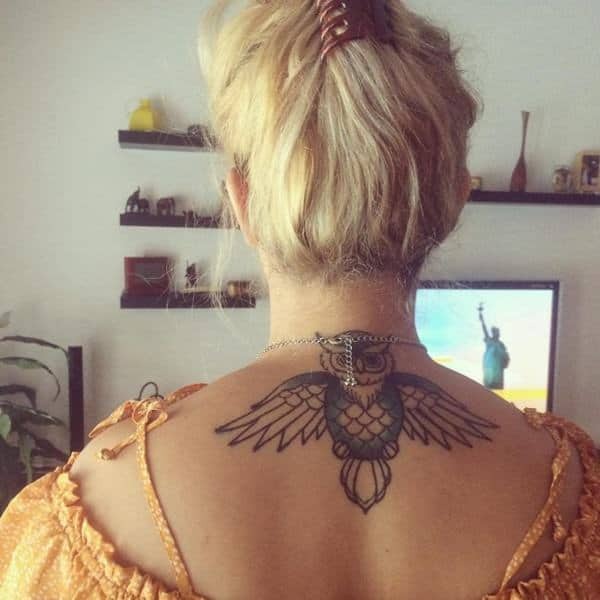 This hovering owl tattoo makes a cute and simple addition to a back piece. 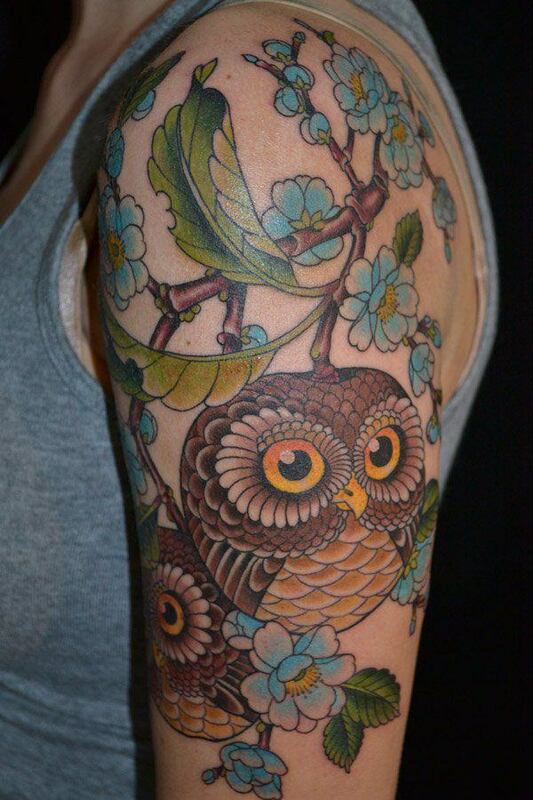 This bright and stubby acorn owl sits comfortably among his home of beautiful blue flowers. This snowy owl with a splash of nontraditional color is on his way to deliver a very important key. 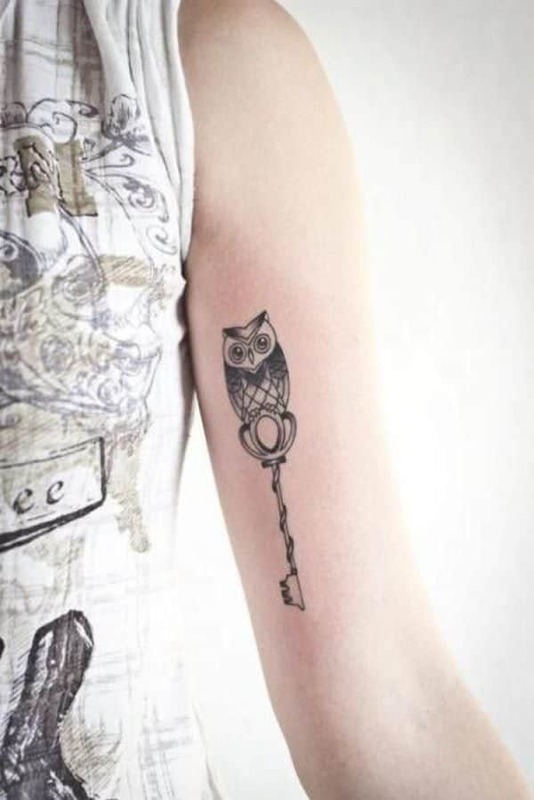 Owls and keys are a common theme, as owls are believed to be guardians or keepers of knowledge and wisdom. You’re never alone. Even the fearsome wolf has someone watching his every move. 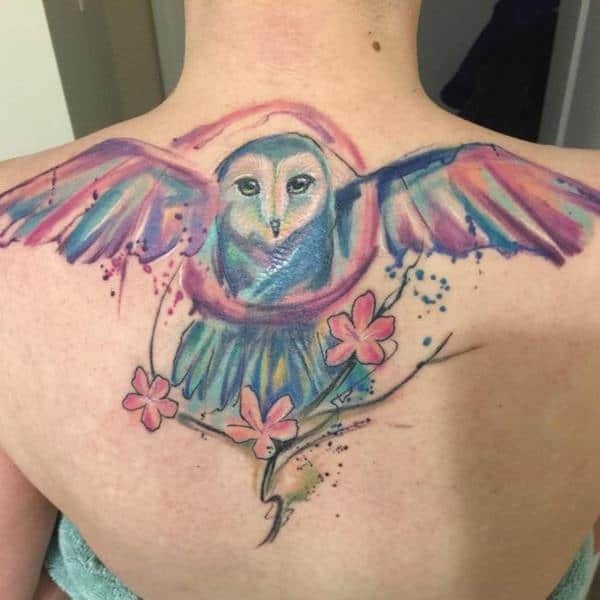 This watercolor inspired owl and flower tattoo makes a nice back piece. 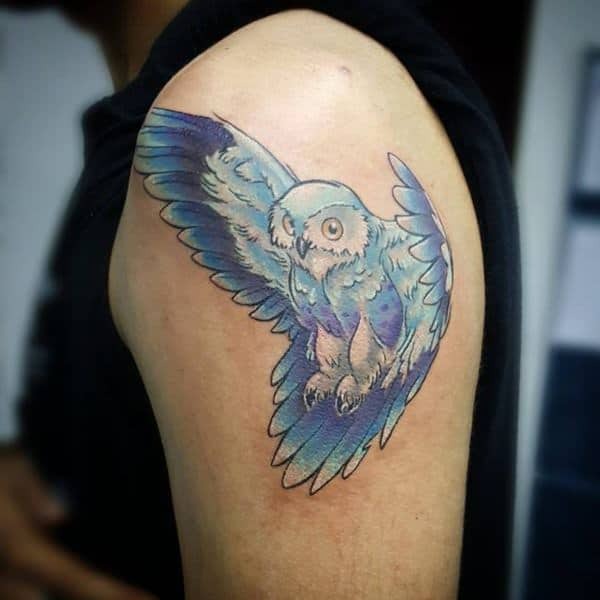 This cute blue and black speckled owl has the cutest look on its face when its taking flight. 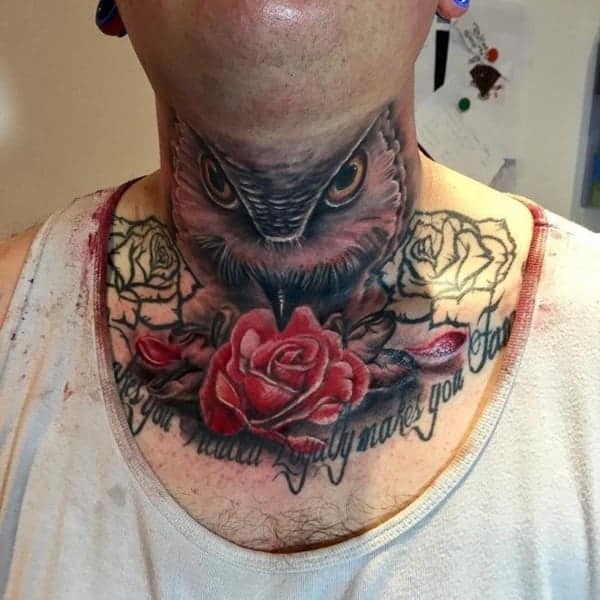 This owl is coming out of this guy’s throat! 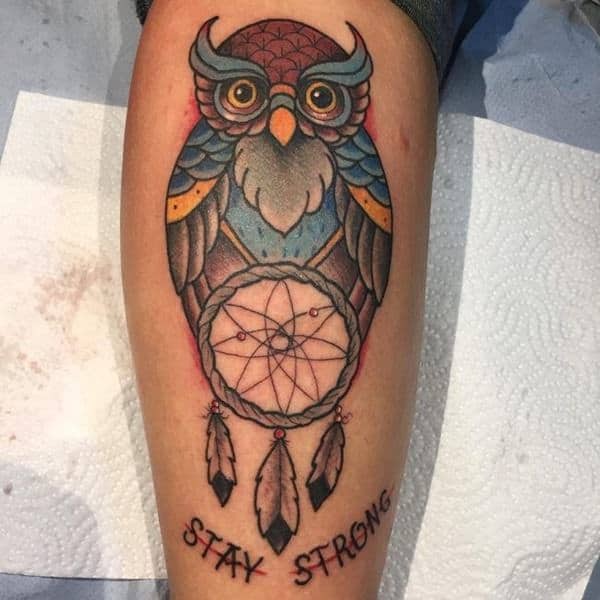 This colorful owl sits perched with his atomic dream catcher, and reminds us all to stay strong. The tree branch makes an incredibly intricate places for this rotund little guy to perch. 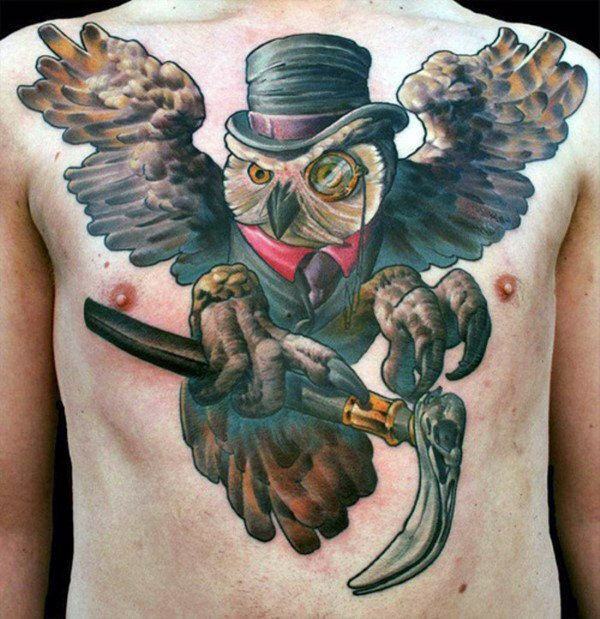 While this owl’s vision may not be 20/20, he makes up for it in dapper fashion sense. 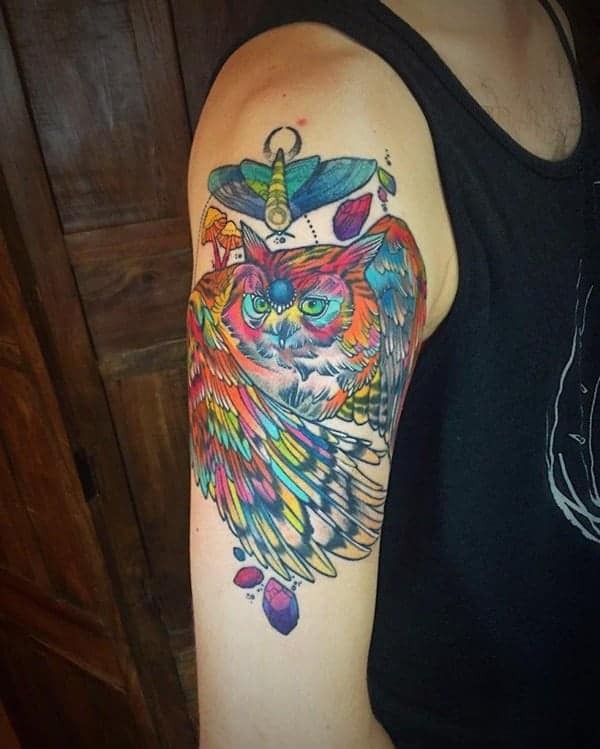 This peacock colored owl is inspiring some major lash envy. 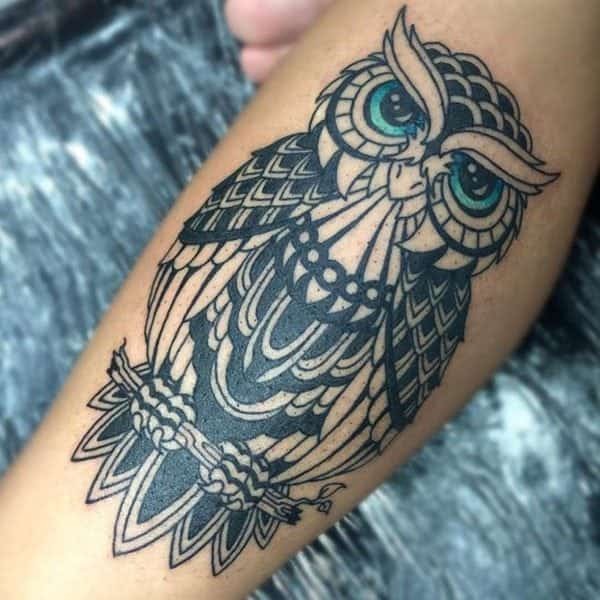 This owl with his sad eyes looks like he’s remembering a time that was lost, reminiscing about a time when things were better. 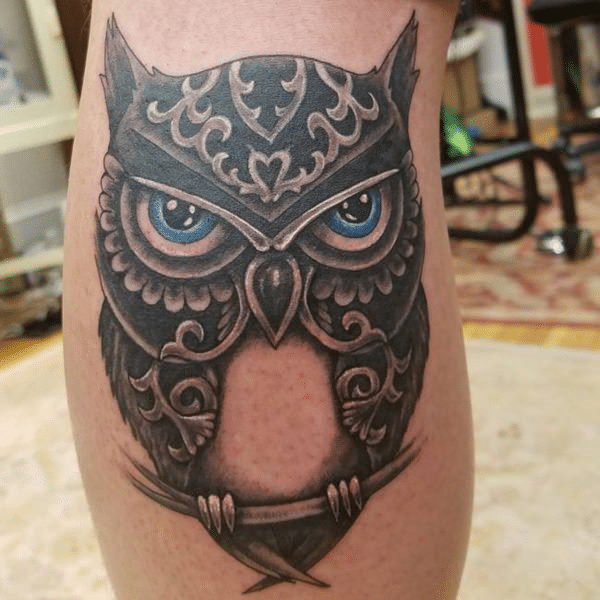 This bright eyed blue owl is so adorable. 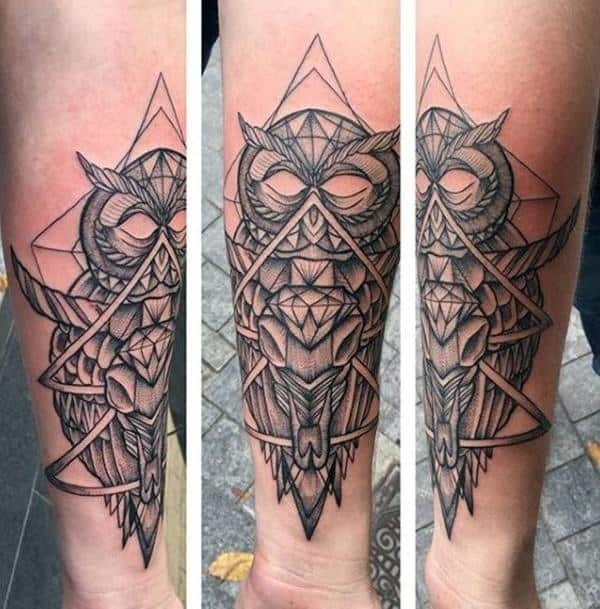 Here’s an owl tattoo combining the highly popular geometric design with simple black ink. 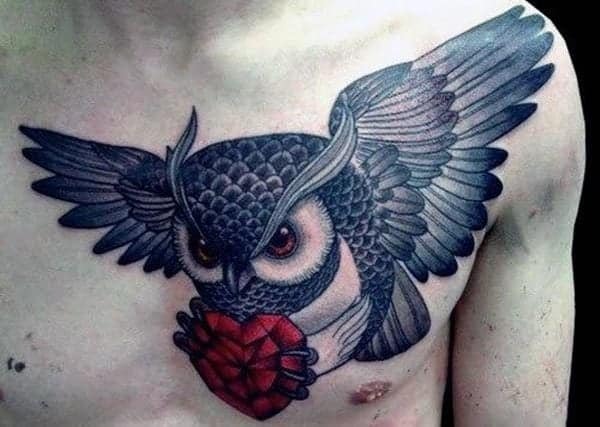 This owl’s wings seem to tell a story of their own. 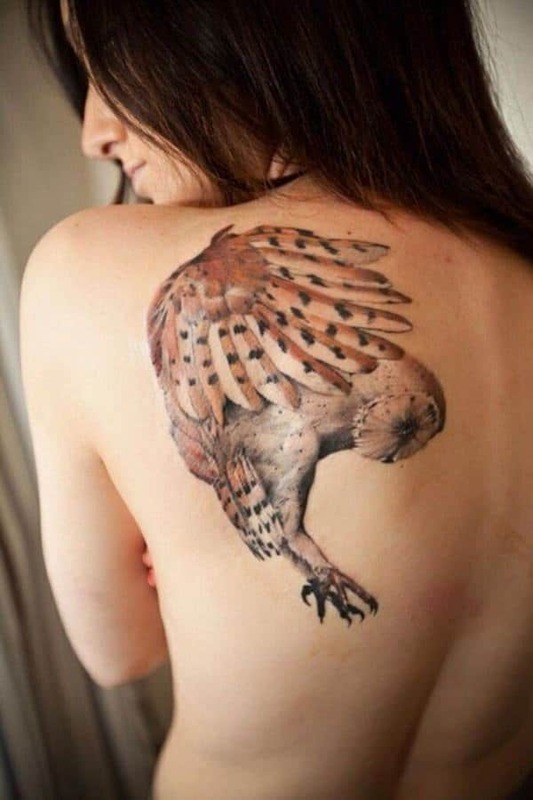 A sea-faring owl seems the best companion on a ship. 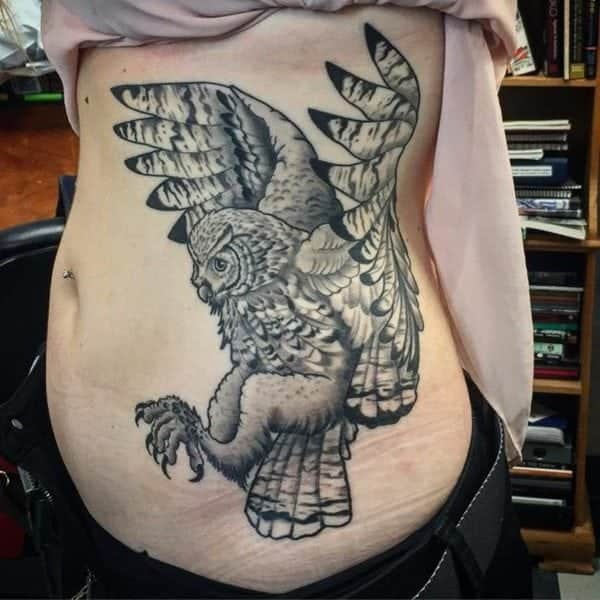 This owl’s brains are coming out! 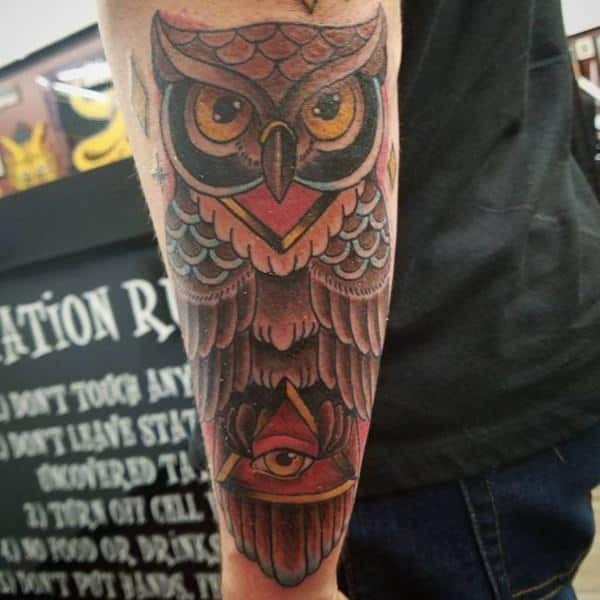 The all-seeing eye and the knowledge from it was just too much for this one owl to handle. 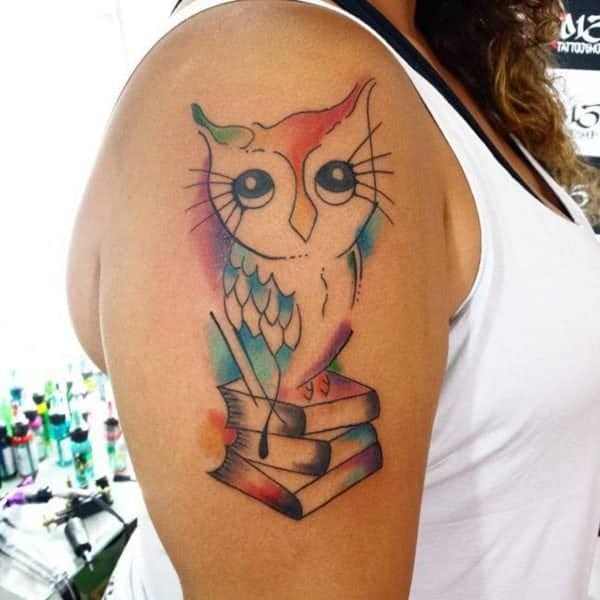 This sweet and colorful geometric owl looks ready to hear all about your problems and offer some comforting advice. This green eyed beauty has some interesting spots. 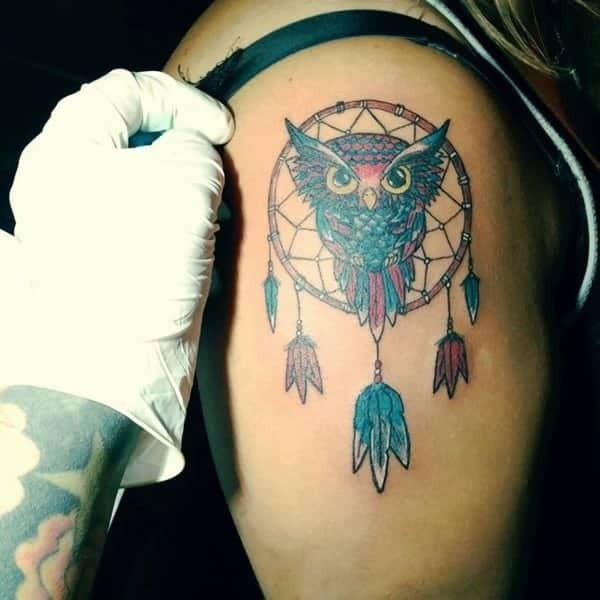 A sweet little owl perched atop your dream catcher, ensuring only the good ones come through. This prairie owl looks like she’s about to catch tonight’s dinner. 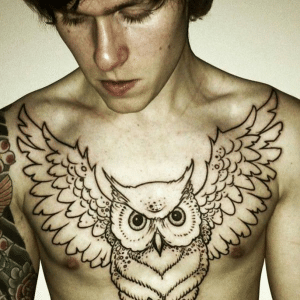 This outline owl tattoo means business. 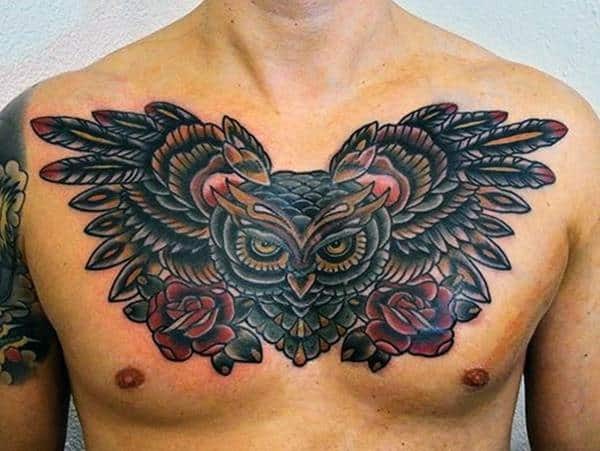 This red and brown inspired chest piece looks like he’s protecting his person’s heart. 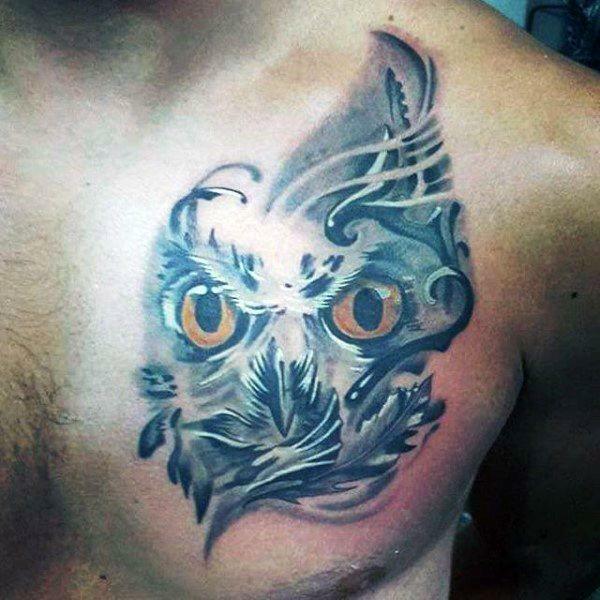 The icy cold stare from this owl head tattoo will leave you wanting for more. Do you keep your keys on a keychain? 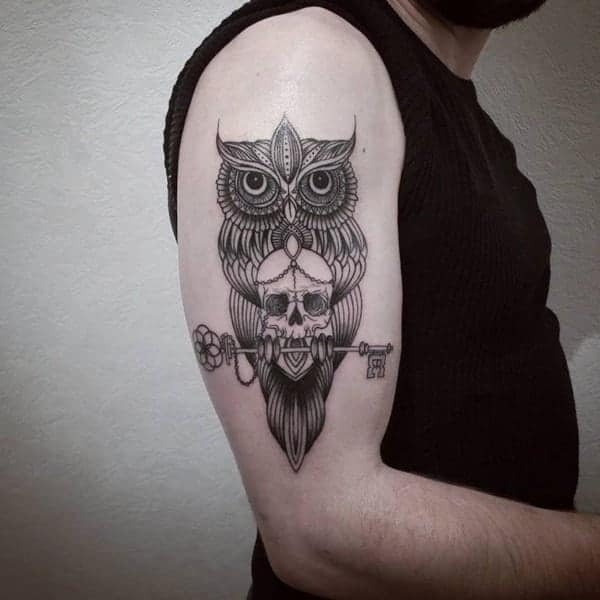 Well, this owl’s keychain is the a skull. That’s one way to not loose your keys. 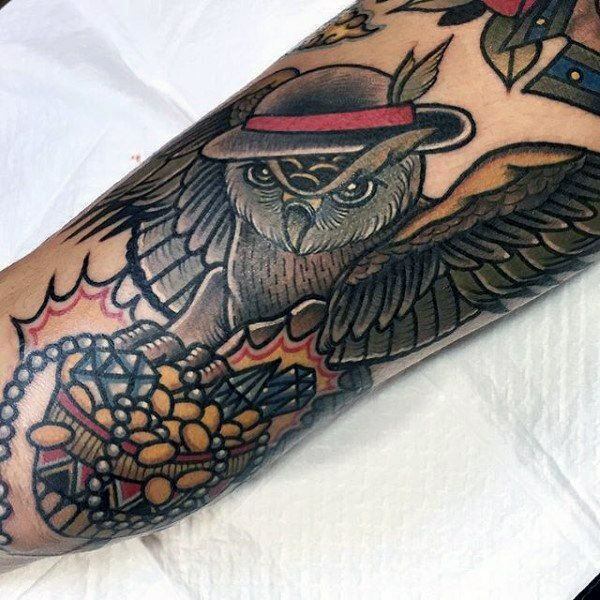 This traditional owl tattoo is holding a crying coffin… very symbolic, but just symbolic of what? The mystery remains. 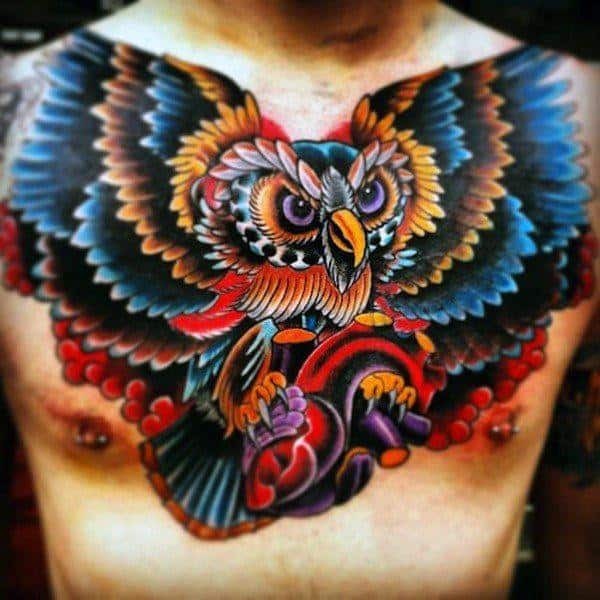 This owl’s heart is a distinguishing feature of the piece. 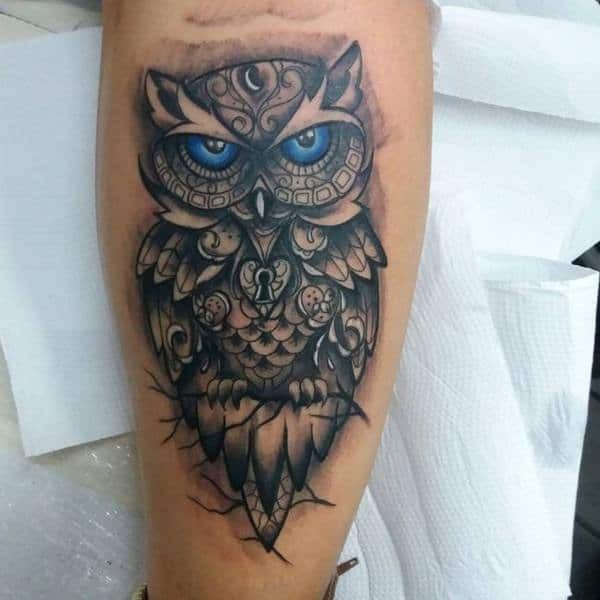 This owl tattoo uses white ink to highlight the piece, making it unique and beautiful. 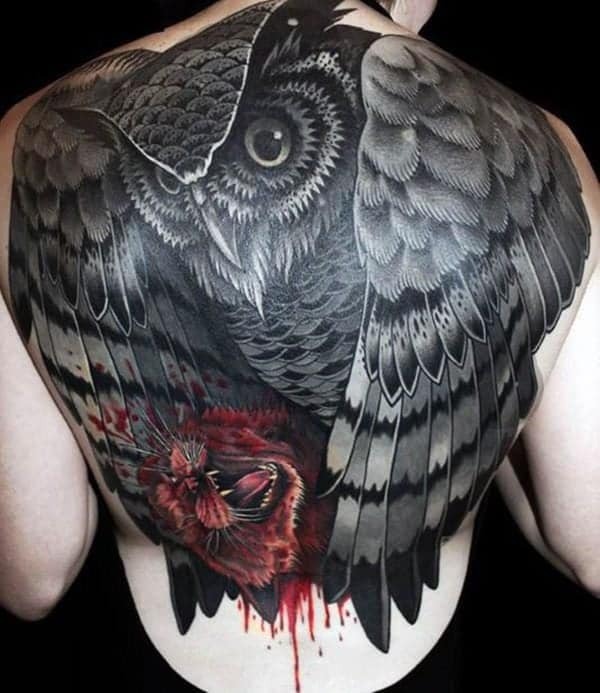 This full body piece really tells an epic story. 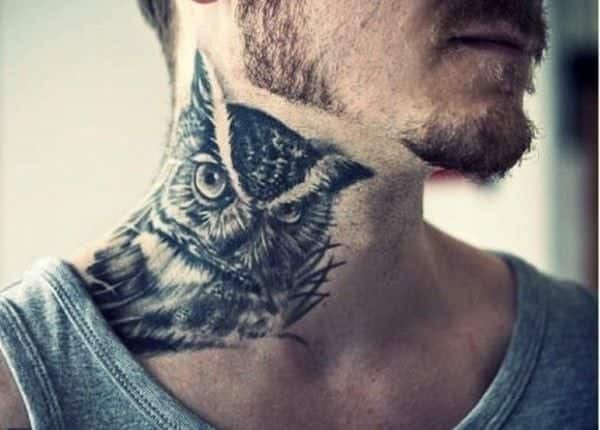 The owl is a dominant feature. 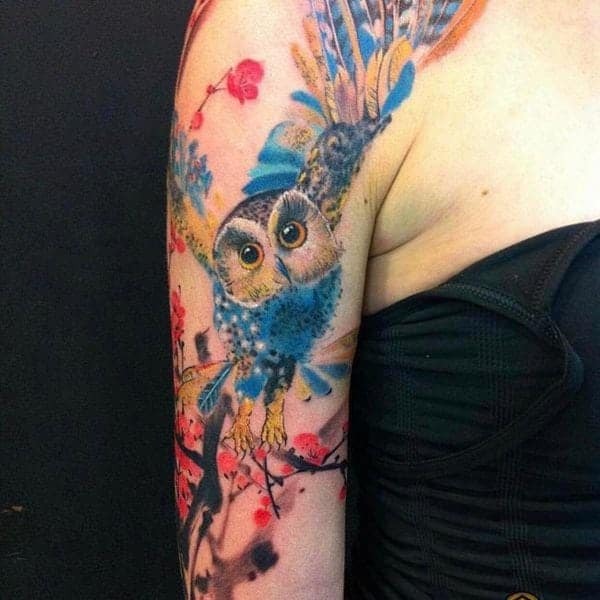 This beautifully done owl tattoo is surrounded by some equally beautiful flowers. 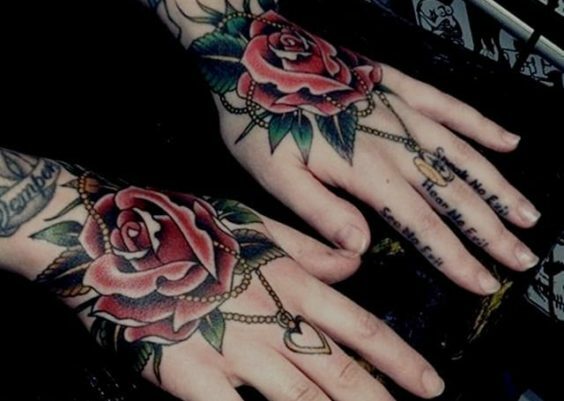 Now who wouldn’t want to roost among a boquet of flowers? 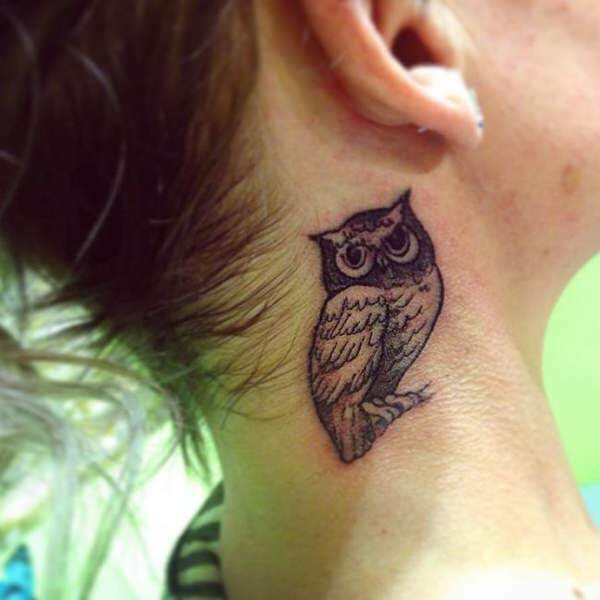 This little creature makes a cute behind the ear owl tattoo. Another blue eyed beauty on a simple, black ink owl tattoo. While this guy may not have the piercing blue eyes, he has a sky blue aura, a color signifiying skillfull communication. 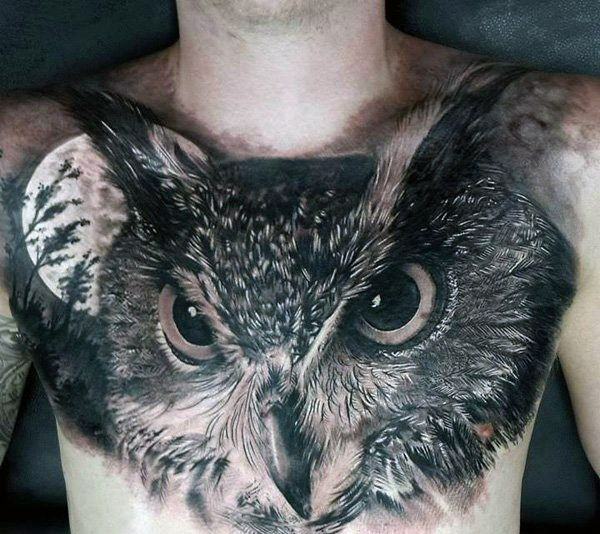 This owl has just received some shocking news! 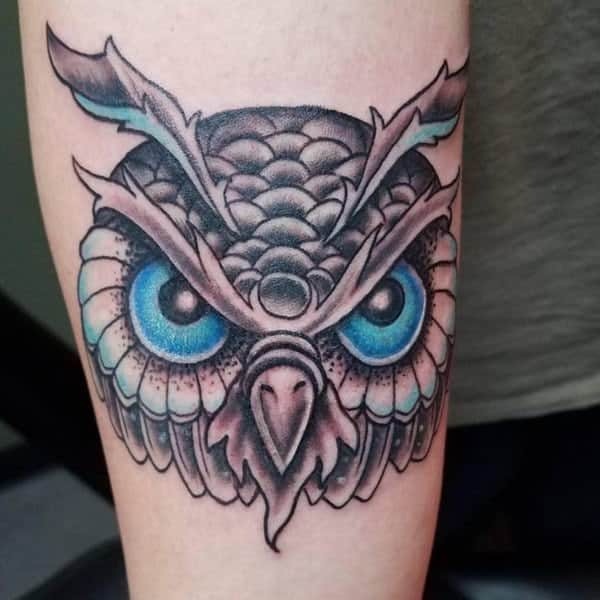 Another blue eyed owl with some definitive swirl paterns as opposed to more traditional feathers. 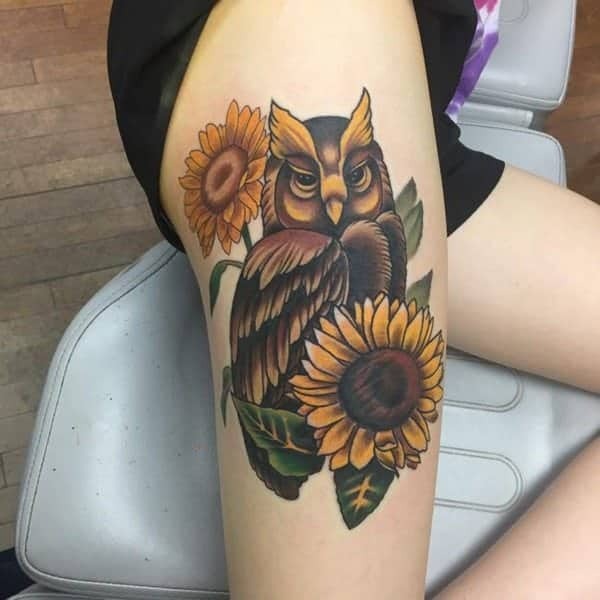 A lackadaisical owl spends her days languishing among the sunflowers. The image immediately brings you at peace. 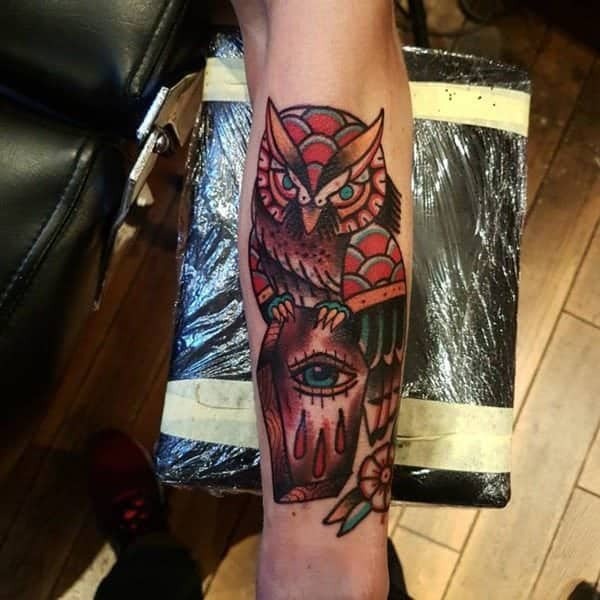 Here’s another owl clutching the all seeing eye. 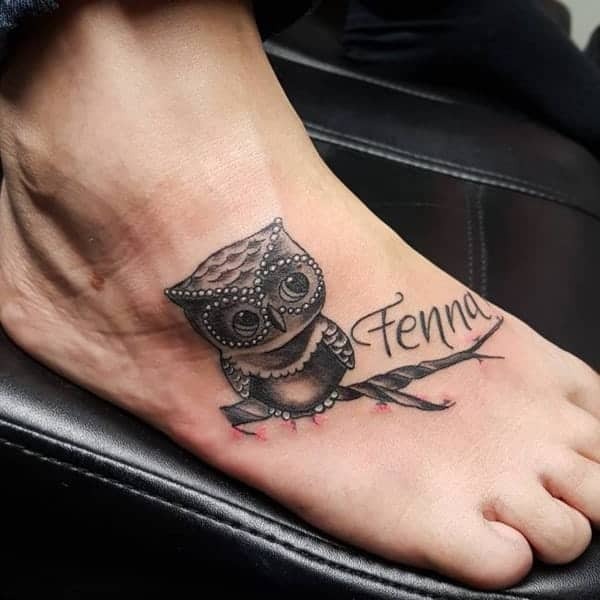 A common theme for owl tattoo combinations. 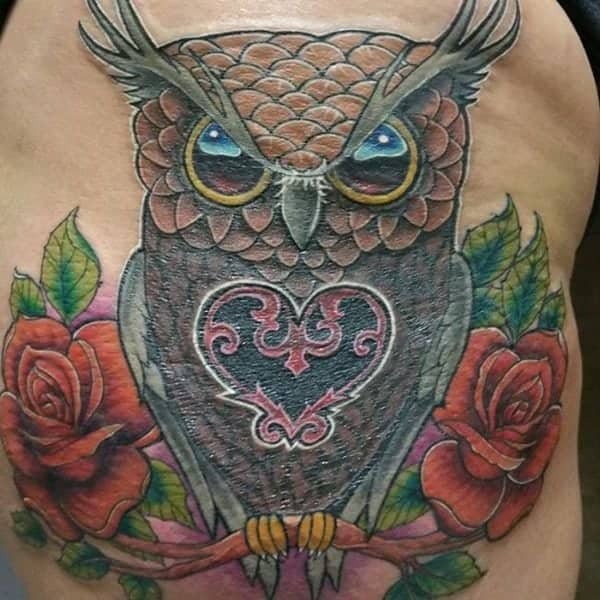 This shoulder owl tattoo has got flowers in her eyes instead of diamonds. 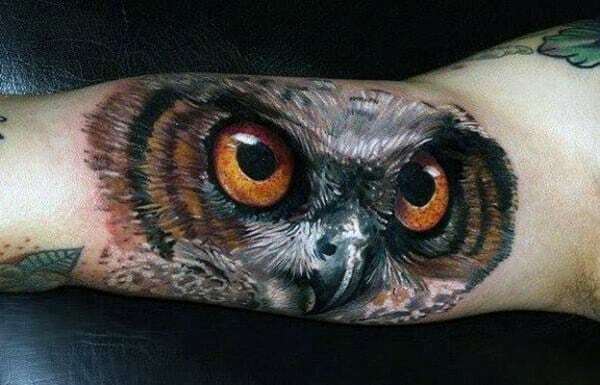 This fillagree encircled owl looks very cute as a side piece. 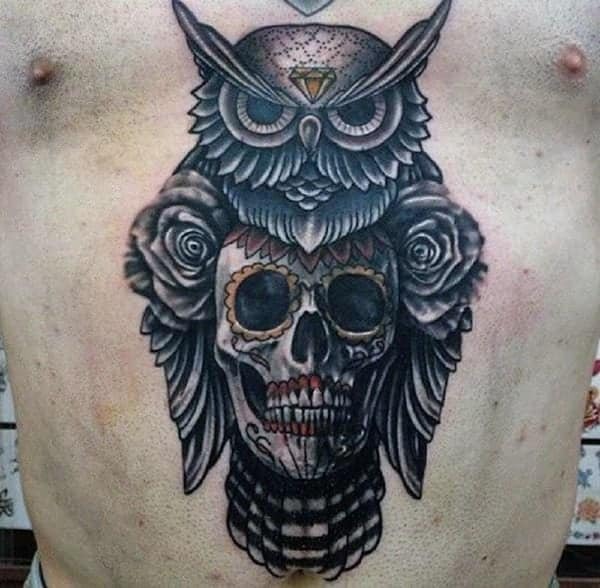 Here’s another common combination: owl and skull tattoo. 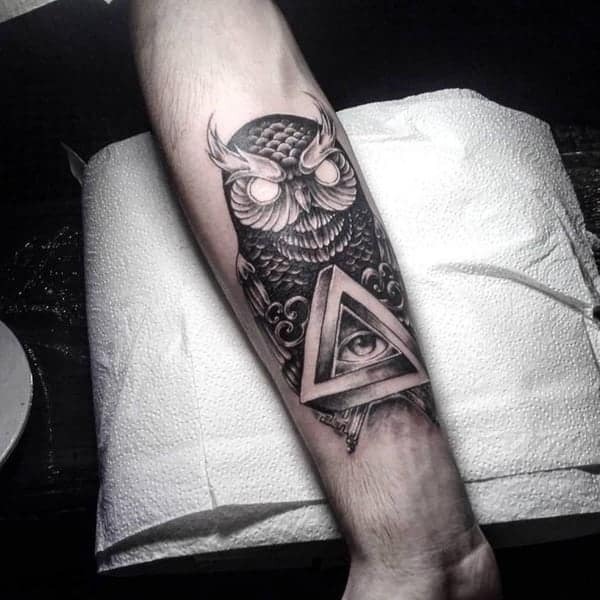 The all seeing eye makes another apperance with an owl tattoo. 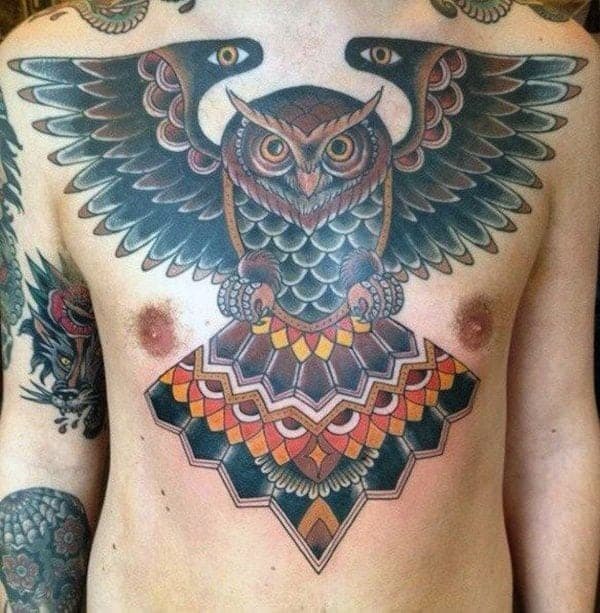 Owl tattoos make a good neck piece, it’s like an extra pair of eyes watching your periphery. 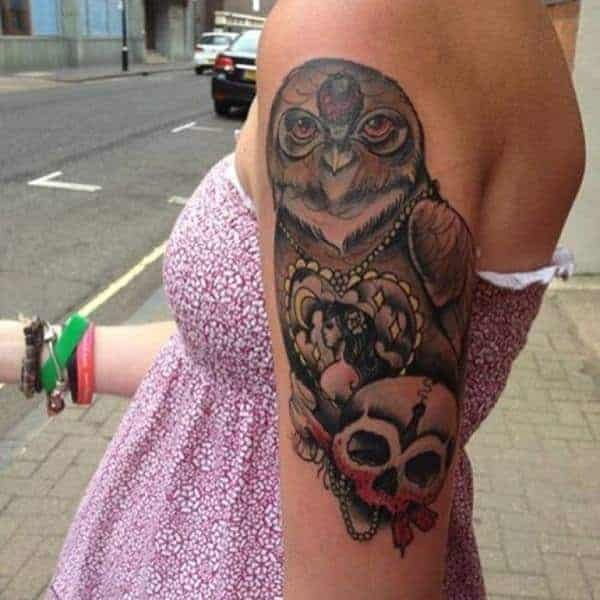 Here’s another owl tattoo clutching a skull, although this one is illustrated from a different angle. 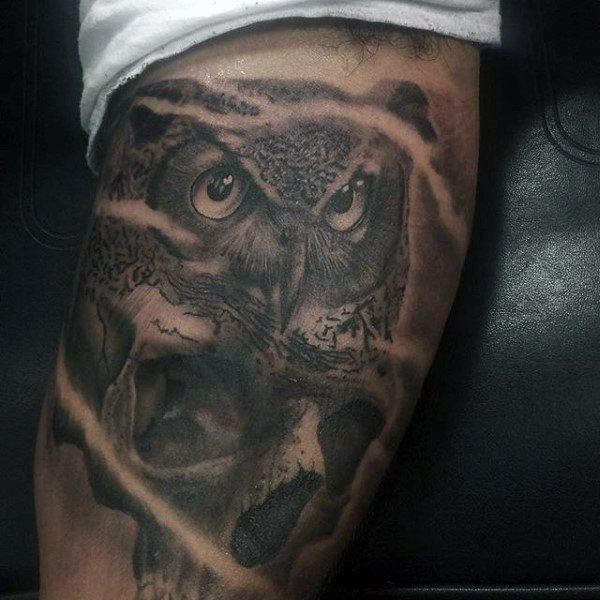 The owl’s head looking straight at you sends chills up my spine! 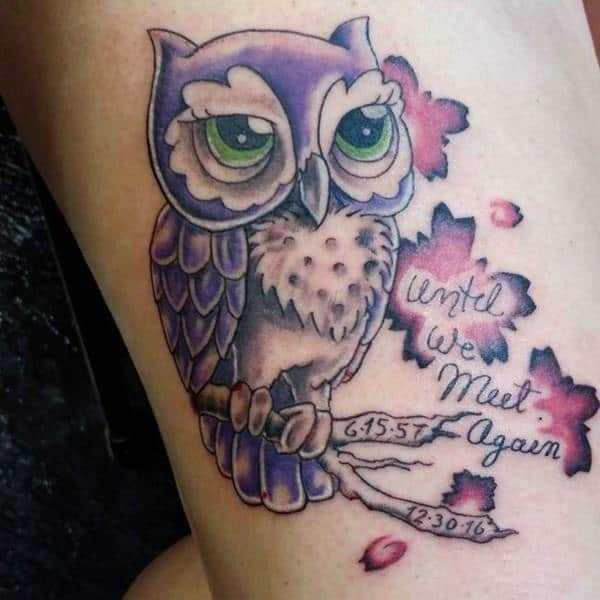 This owl tattoo looks like it was on the tryouts for the Hogwarts House of Ravenclaw’s mascot. Too bad the crow beat him out. 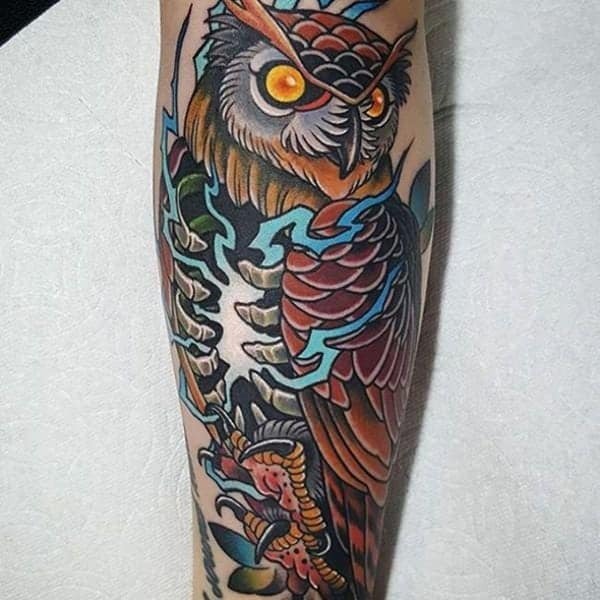 This owl makes a nice forearm piece. 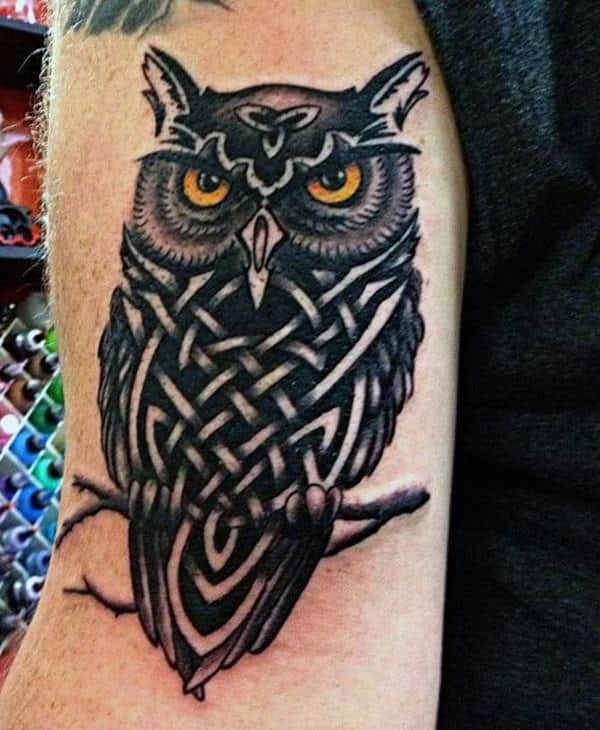 This is the first Celtic owl tattoo to be seen thus far. Interestingly, there aren’t more. 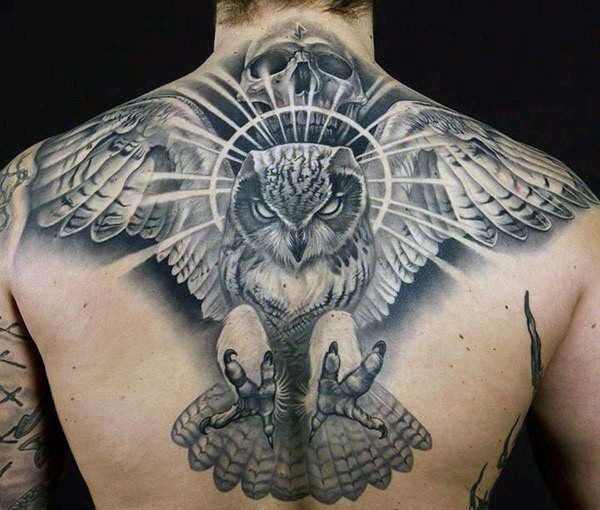 Celtic folklore includes many stories about owls as key characters. Lost? Ask this guy for directions. 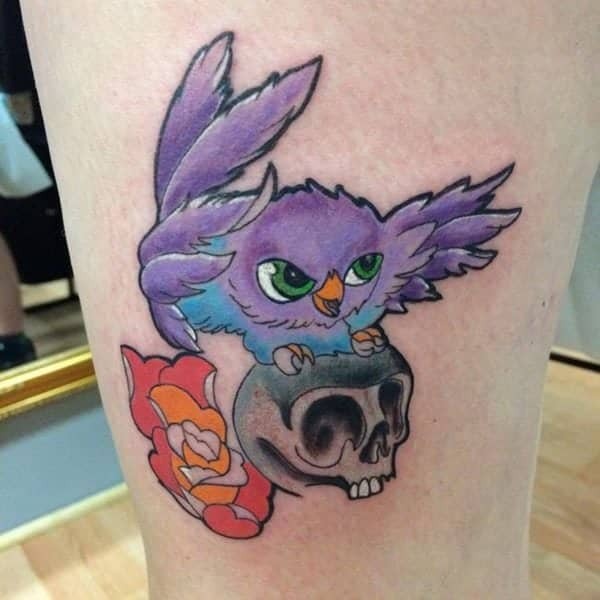 This owl shelters his sugar skull from harm, and has a diamond atop his head. 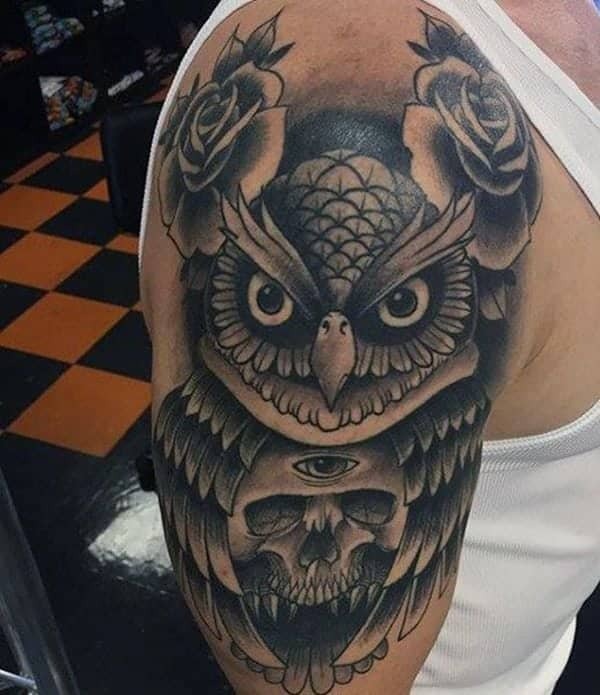 While the skull may no longer see, the owl sure can.. You’d have a pair of watchful eyes guarding your back with this back of the neck, owl tattoo. 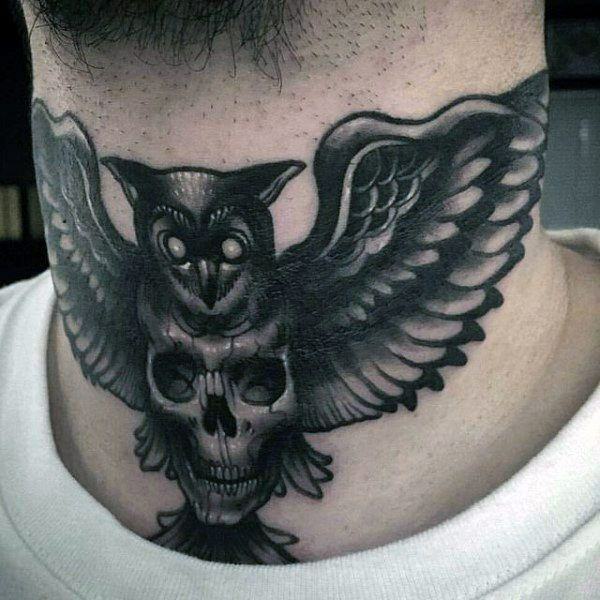 This owl sits atop his skull, must be a fresh skull, as there aren’t any teeth missing. 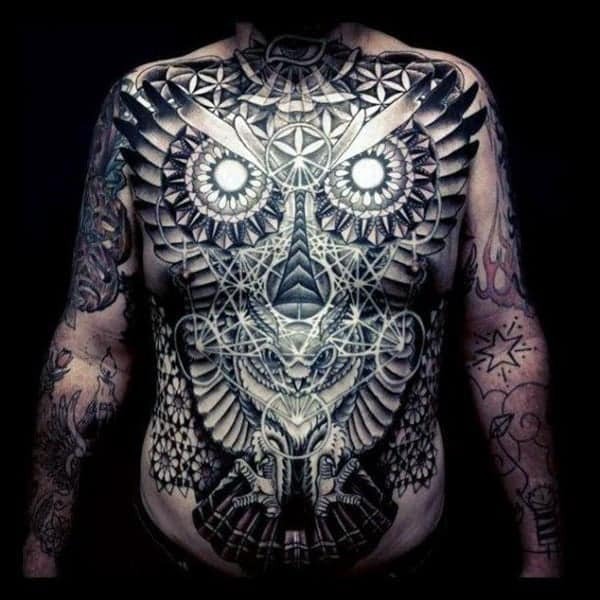 This owl head figure tattoo has some interesting patterns, almost a traditional style tattoo. 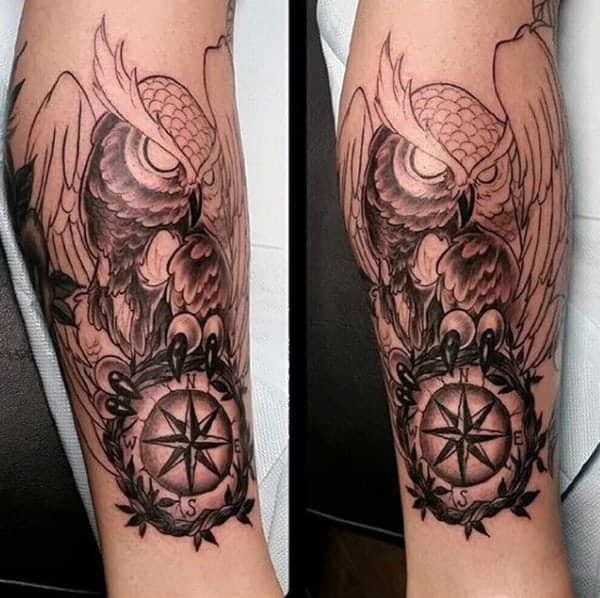 This snowy owl tattoo is protecting a number of items: a compass, a wolf, a candle, and more. 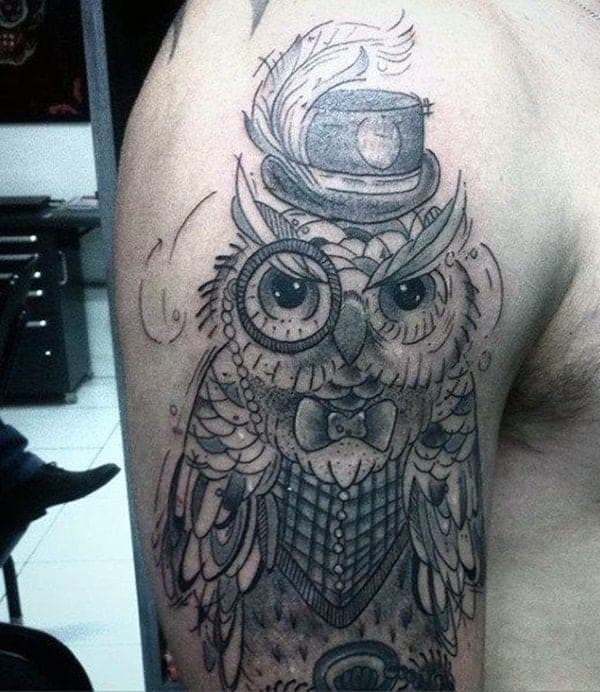 This owl tattoo is a combination of English gent with a flair of whimsy. This fiery owl is flying with the torch of wisdom. 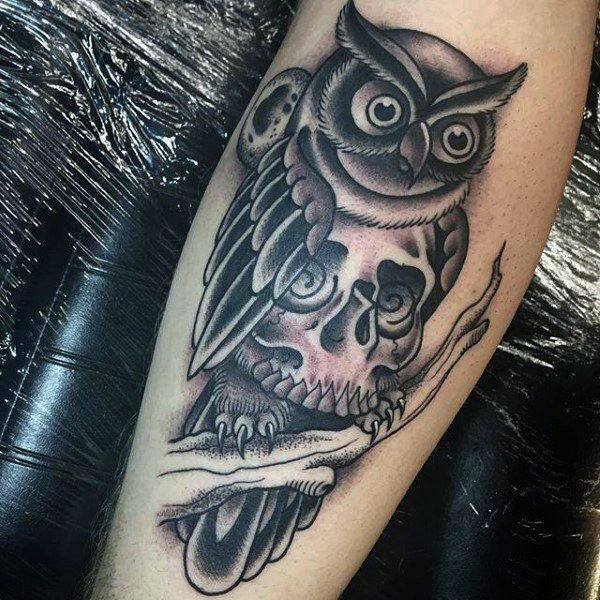 This owl’s keep is a skull with a third eye. 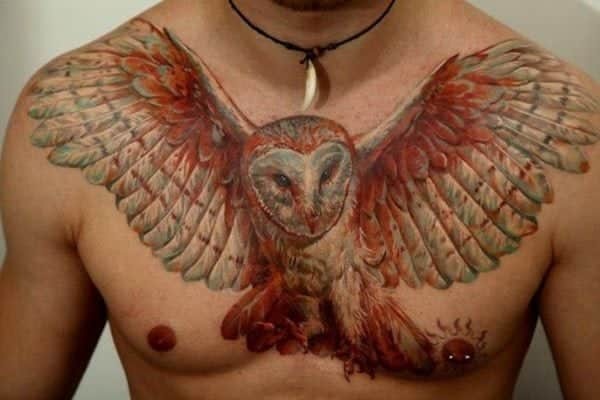 Further proof owls have knowledge far beyond our understanding.